Super EXCITING news! !😄🌞 Brand NEW fermentation workshop announcement. 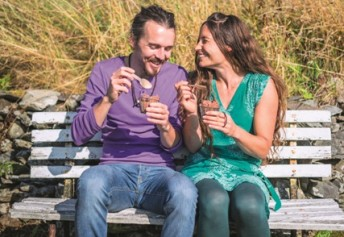 We have never met anyone as passionate about fermented foods! A real Fermentista!! Janice is a macrobiotic health coach and writes the wonderful blog ‘Nourished by Nature’, running regular fermentation classes in and around her Glasgow home. Janice will show us how delicious fermented foods, made with simple techniques, can heal ourselves on every level and taste amazing! We’ll be sampling seasonal kraut, some fermented relishes/chutneys/dips and also some seasonal kombucha flavours! Full info for our awesome Vibrant Vegan! Plant-based cooking and yoga holiday is HERE. We’ve already sold over half the rooms in the first week!! If you have a booking form, please return it asap, we can only guarantee bookings once we have the forms. 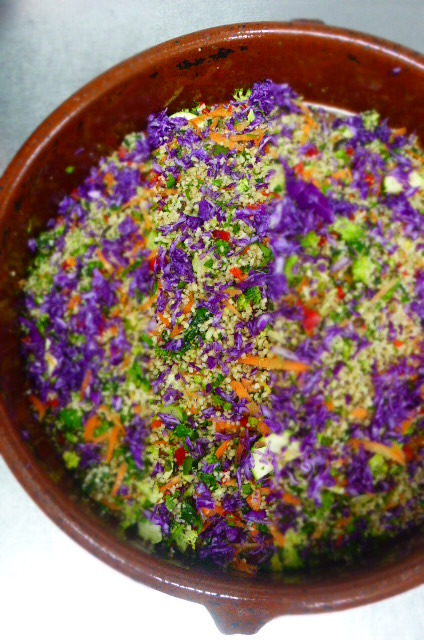 Otherwise…..
Fermented food, delicious and very healthy! 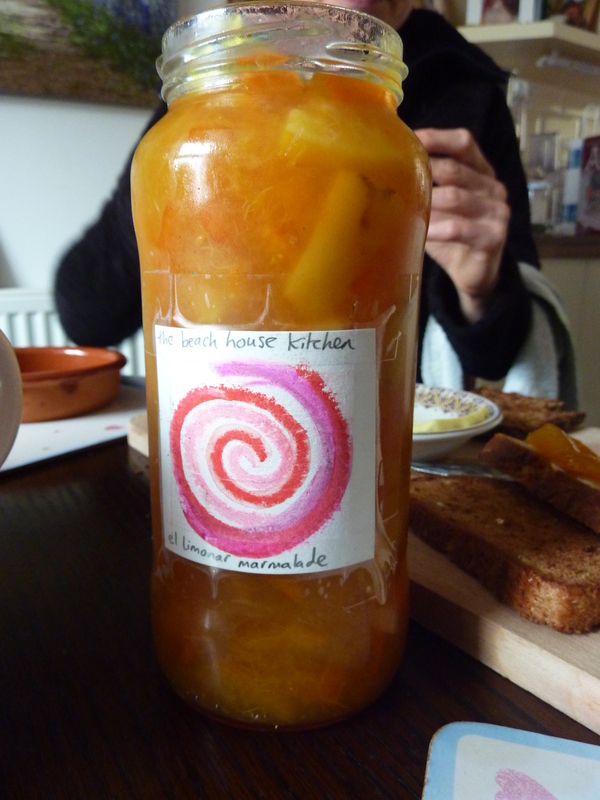 To get a flavour of things, you’ll find lots of delicious fermented food recipes over on Janice’s blog HERE. We love the radish bombs, fermented tomato salsa and mushroom pate and coffee kombucha rocks!! Plus, Janice makes the most incredible sourdough loves. Here’s a really quick and easy way to pickle rhubarb. 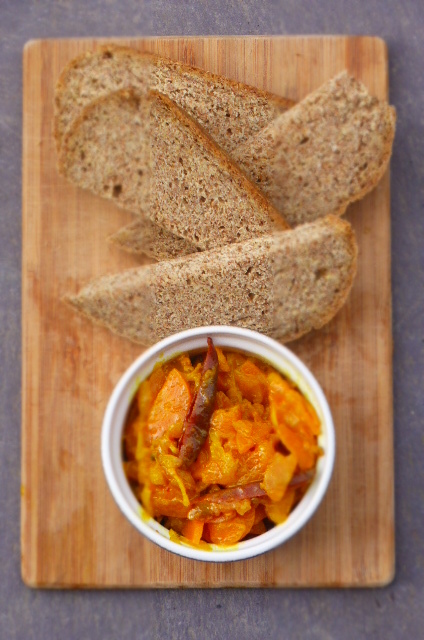 I’ve added some ginger, which gives even more intense and beautiful flavour to this pickle. The method could not be much easier, and it’s a great technique for preserving delicious produce, enough to enliven any meal! Rhubarb makes a great pickle, maybe you haven’t tried it? I find it goes well with Middle Eastern salads, anything with a bit of spice. 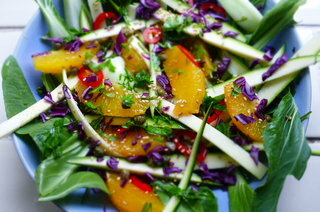 I also like it with Japanese style salads. It has a real sweet and sour twang! When this lovely bunch of rhubarb landed in the kitchen we wondered what to do with it? How to make it shine! No crumbles here. I shouted “Pickle!” Jane shouted “Ginger!” And it was as easy as that really. It has been a stunning week, Spring has been in full swing (and then it snowed/ hailed for a couple of days!) A Snowdonian Spring! It has been still and sunny, and this extra sunlight and warmth has meant some surprises in the poly tunnels. We’ve had some beautiful and colourful, organically grown, produce coming off the land this week at Trigonos. Owain (our resident Horticulturalist and Organic Superhero) has been appearing in the kitchen with arm loads of all kinds of goodies. Most of these are seeds from last year, that have decided to make an appearance in the poly tunnels; ruby chard, swiss chard, purple rocket and some radiant rhubarb!! You know I love this one. Curly Kale. Along with a host of herbs and a scattering of salad leaves, and of course outside, the wild garlic is doing it’s thing. 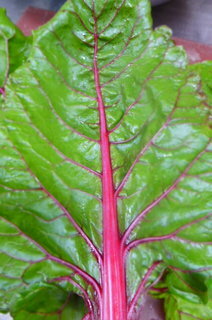 Ruby Chard, love the vibrant colour! I always feel like the luckiest cook alive to have access to this kind of produce. Especially at this time of year. Purple rocket. The flavour here is amazing! Very peppery and fruity even. Produce picked in the morning and by lunchtime is being served (or pickled). I love it! This is a rare chance to come over here to beautiful Snowdonia; relax, rejuvenate and get inspired! Plus, sample lots of dishes prepared by our awesome team of chefs with produce straight from the land, and even have a tour around the farm with Owain and myself. A little bit of foraging and lots of chat about excellent produce and organic happiness. The holiday is booking up quickly. Exciting times!! Only use the pink rhubarb stalks, never the leaves. Any excess pickling liquor can be used in dressings or to marinade tofu, for example. You’ll need two clean glass jars with lids. Gently pack the sliced rhubarb into your jars. So it’s snug, with a little room left at the top. Place the vinegar, water, bay leaves, ginger and sugar into a small saucepan. Bring to a boil. Pour this mixture over the rhubarb until it’s covered. I add the bay leaves and ginger to the jars also. Leave to cool. That’s it! Label and date the jars. If your jars are clean, this will last a long time, one year or more when stored in a cool place. Rhubarb is packed full of minerals and vitamins. 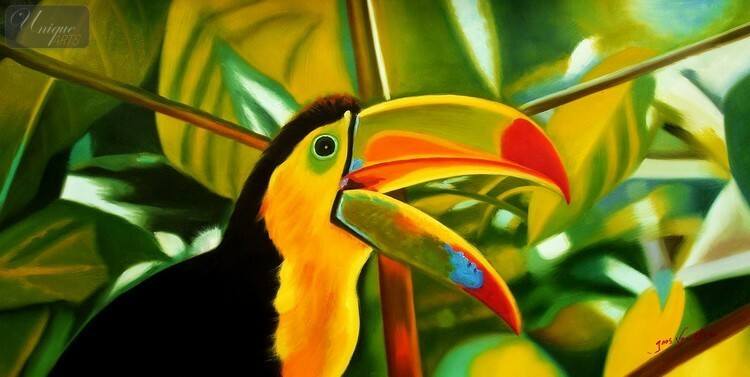 It’s a source of vitamin C, protein, calcium, fibre and beta-carotene. Plus a whole lot more. Much more than just a crumble! Celeriac, Brussel’s Sprouts, Swede, Squash and Potato Crisps – Food waste made tasty!! These just make perfect sense. 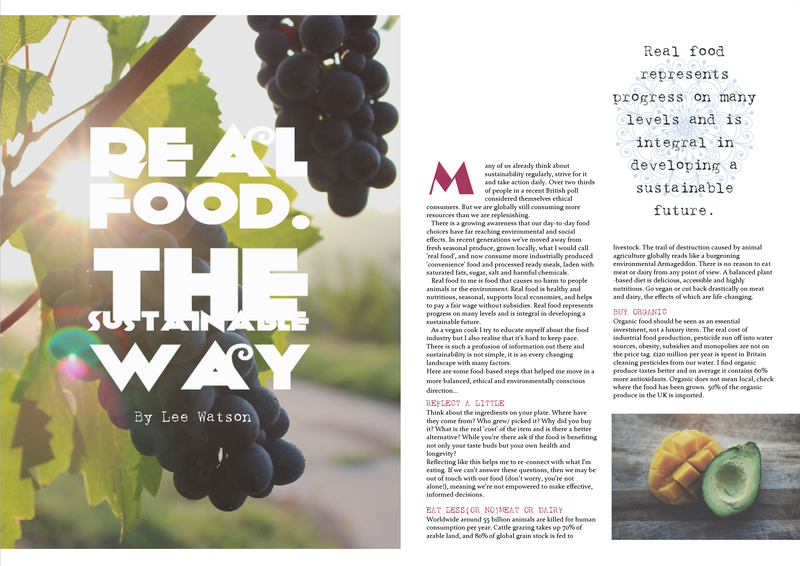 Transforming, what for many, is food waste into something delicious. Why throw all those vegetable peels away? Especially when you can make these delicious, light crisps. They’re very tasty and they crisp up beautifully and are so easy and quick to prepare. Veg peels are also packed with vitamins, fibre and minerals. We normally throw away by far the most nutrient-rich part of the vegetable! See below for more, ‘Foodie Fact‘. 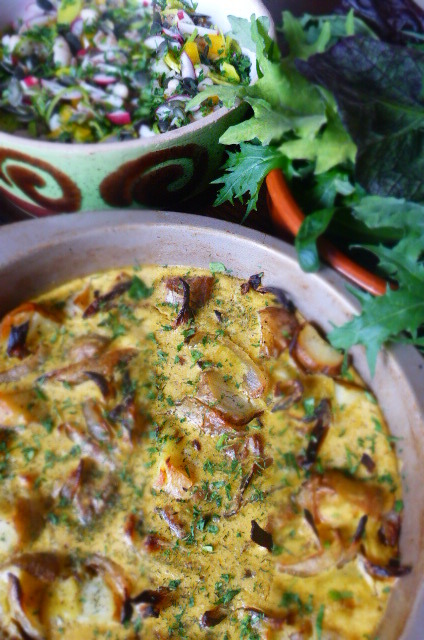 I used some of my favourite winter vegetables; celeriac, squash, potato, swede, Brussel’s sprout leaves and parsnip. I think these crisp are ideal when you’re making a big dinner, when your food waste bowl fills up, it’s time to get excited. Peel crisps are on the menu! I’ve been making a vegetable and potato broth for a while now and needed a crisp topping, something that would be light and packed with flavour, with that very crisp texture. Here they are! They arrived by chance the other day, I was frying off some rostis and had a large bowl of vegetable peels……It just fell nicely into place. I was blown away by the results, you’ve got to try these out! You can flavour these crisps with anything you fancy, some smoked paprika is nice, I fried some fresh herbs, which gave a earthy, full flavour to the crisps, plus, you can eat the herbs as well. A sprinkle of sea salt is essential. Try seaweed flakes, nutritional yeast flakes (NOOCH! 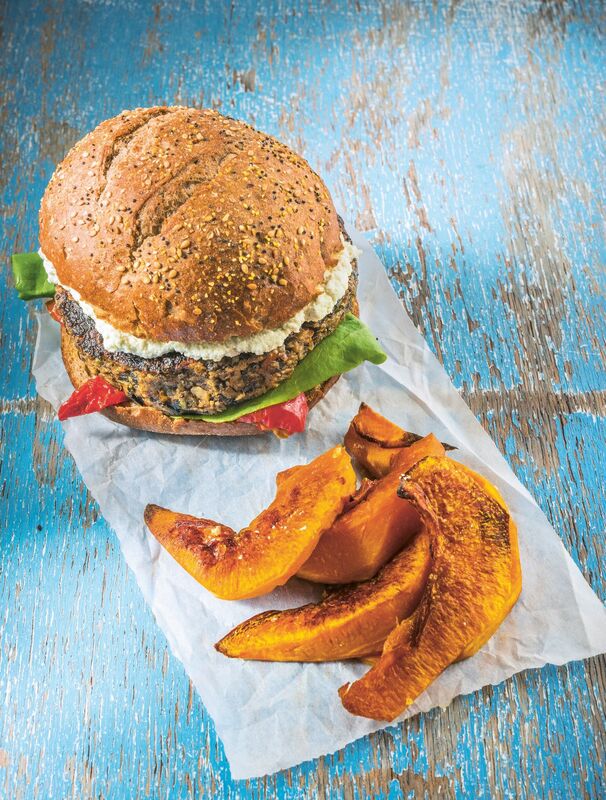 ), mushroom powder, za’atar and sumac (especially yum), citrus zest, garlic powder and chilli, mixed spices, you can even make peelings like sweet potato and carrot into a sweet snack, with cinnamon and sugar. I’ve given you two options for cooking, roasted in an oven or fried in oil. As you would expect, the fried in oil option is a crispier way of doing things. So crispy, these are the best! There are many ways, this is mine, hard learned from years of peeling piles of vegetables in kitchens. Here we go. Use a sharp, French peeler, they’re by far the best and most efficient. A blunt peeler is a recipe for grunts and straining. A sharp peeler will glide, most of the time, through the veg peel. Have a food waste bowl handy, it keeps your kitchen surfaces clean and tidy and ensures your chopping board is kept clean. 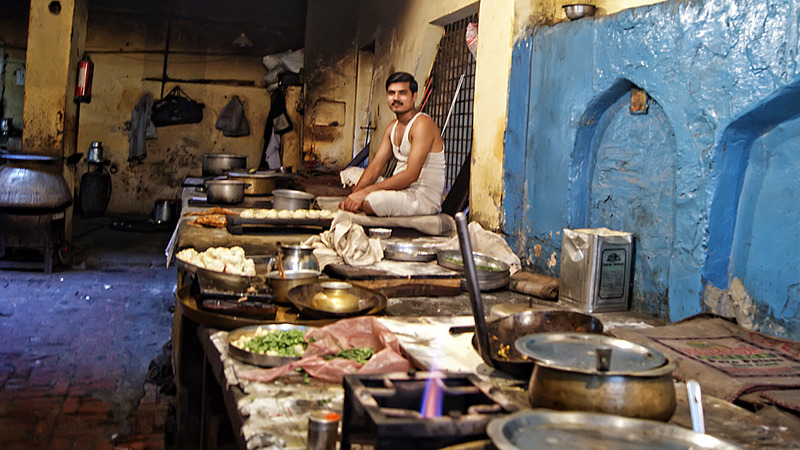 Working in a clean and efficient way in the kitchen is essential. The easiest way to peel anything is to not pick it up. Leave it on the board, hold it down and peel away. You’ll find that holding a vegetable in your hand, especially large, heavier veg like squash or big potatoes, lead to exertion and strain. Let the board and the sharp peeler do most of the work for you. Because the veg is stable, you’ll also notice you’ll get longer and better peels to make crisps out of. I hope that makes sense, it took years for me to figure this one out!! A good peeler is sharp, be careful when peeling. I rarely cut myself in the kitchen, but when I do, it’s normally when peeling things. I get a bit carried away sometimes!! Try out any veg peels, but make sure they’re dry. Pat them with kitchen paper or a clean kitchen towel. Make sure you wash your vegetables thoroughly and give them a good scrub if needed. Use any veg peelings, beetroot, sweet potato, carrot, for example, are also delicious. I use a French Peeler when peeling vegetables, they’re the best. If your peeler is nice and sharp, you’ll get nice thin, uniform peels. That’s what we’re looking for. The longer the better. These veg peels are best cooked fresh, not too long after you peel them. It’s always a good idea to use organic veggies when you can, especially with these crisps. You know your oven, these crisps will burn quickly if you have hot spots, make sure you turn them and move them around on the tray to get even cooking. If you’re going to fry them, and in fact generally with cooking, use an oil with a high smoking point. Cold pressed rapeseed oil works very nicely for me. In a small saucepan, add an inch or so of oil. Warm on a high heat. Pat your vegetable peelings dry with kitchen paper. Test the oil is hot by dipping a single veg peel into the pan, if it sizzles frantically, it’s ready. Add your peelings and herbs to the pan, stir a little so they don’t stick. Don’t overload the pan. Fry into batches if needed. Fry until crisp and golden. Remove using a slotted spoon and place on a plate lined with two layers of kitchen paper, leave the crisps to drain off excess oil. Serve straight away, season and flavour as you like. Preheat an oven to 190oC. Toss the peelings and herbs in a bowl with 2 tbs cooking oil until well coated. Add spices or flavourings now if you’re using them. Spread them out, without overcrowding, on a large baking tray. Pop in the oven, bake for 5-7 minutes. Turn the crisps and bake for another few minutes. Check them at this stage, this is the burn zone, when they may well go from perfect to a burnt crisp in a minute. Keep your eye on them! Most of the nutrients of vegetables is found just below the skin, so basically, we normally throw the best bit away! This varies from veg to veg but generally, veg peels contain considerably more vitamins, fibre and minerals than the rest of the vegetable. The same can be said for many vegetable leaves. Here’s a quick example; it’s said by some that non peeled apples contain over 100% more vitamin C and A than peeled apples. Plus over 300% more vitamin K. Pretty impressive!! A non-peeled potato contains over 100% more potassium, vitamin C, folate, magnesium and phosphorous, than a peeled one. The research on this, like with most things nutrients and health, varies. But from what I’ve read, everyone agrees that veg skins contain good amounts of the right stuff. The skin also contains loads of anti-oxidants and fibre. So if you feel like being healthier, leave your skins on! 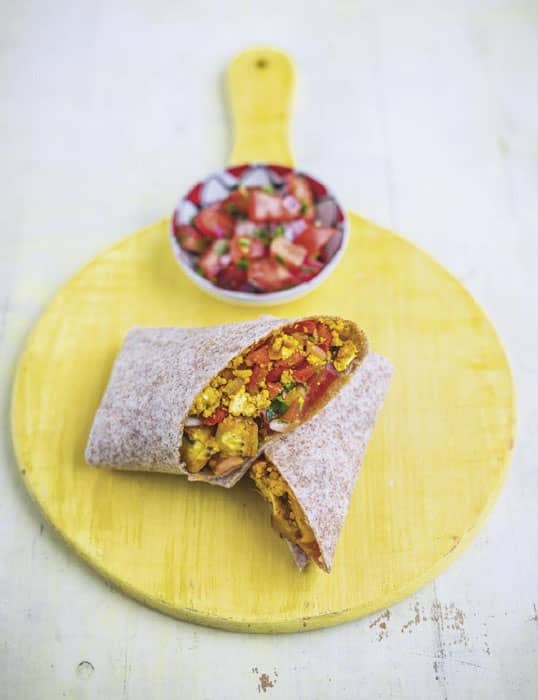 A simple, colourful and delicious brunch that is ready in double quick time. I wanted something fresh, tasty and healthy this morning. It’s Sunday, a treat brunch is on the menu! 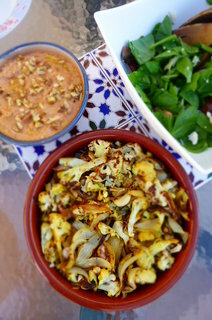 I love baked beans, but fancied something healthier with a spicy and smoky twist, also pan fried vegetables with some of my favourite flavours of the Middle East. 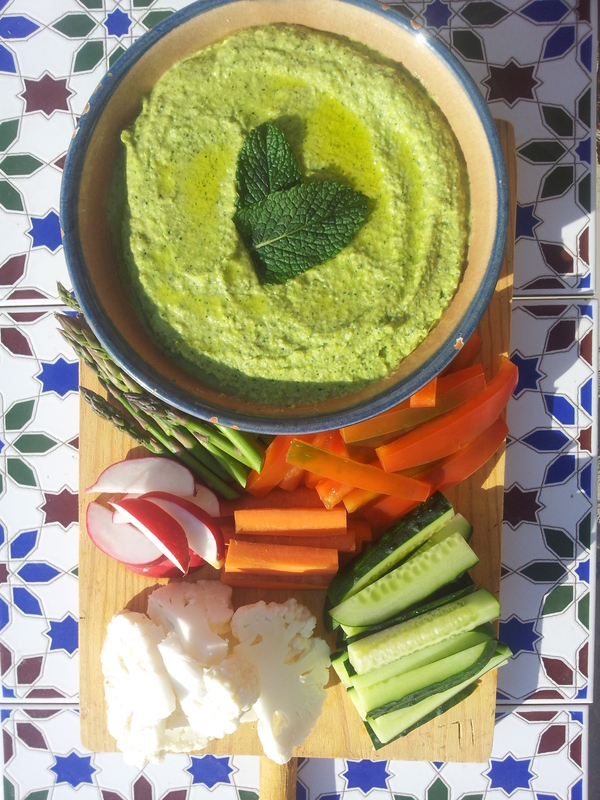 When this brunch is served with hummus/ tahini sauce and toasted pitta bread, it hit’s the spot; weekend, weekday, in fact any time of day. Add bulghur wheat or cous cous to make it a hearty lunch or dinner. I love the combination of delicious, fresh vegetables, warm breads, olives, herbs and something tahini-ish. Its a tried and tested format for a tasty vegan meal. Light and full of flavour and nutrition. With that in mind, this is my version of things today, with what we’ve got locally (and in the cupboards/ veg basket). That’s how my favourite recipes arise, out of necessity and a chunk of inspiration. Bringing the best out of what you’ve got. I only ever plan meals if I really have too. It’s that time of year when we’re all feeling the pinch as far as seasonal veggies are concerned. I can’t wait for Spring, the wild garlic, dandelions, elderflowers, nettles etc all on the way soon. Trigonos has been stunning this past month, this is where we have coffee/ lunch. Not a bad view! The beautiful Nantlle Valley. At Trigonos, preparation is in full swing for the coming growing season. The seeds are being sown and the soil prepared. With all this uncertainty about our food, something to do with that Brexit thing that’s going on, it’s a great time to invest in and celebrate local farmers/ growers. 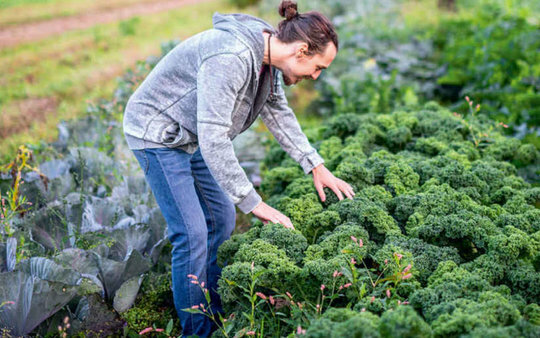 Having organic local produce available is a real blessing for any cook, but I think anyone can feel the benefits of eating with the seasons and celebrating what’s available in our area. Hope to catch you there and get loads of new foodie inspiration. Seems like every year, there is greater diversity at these festivals and plant-based options. Up-date on our cooking retreat in Spain this May, Taste of Bliss (info here). We’ve had a cancellation! Which is actually good news, because we now have one double room available just for you!! Maybe you’re looking for some time to relax on the beach with a wonderful group of people, learning to cook some amazing plant-based food and explore the local area? Who isn’t?!! Let us know if you’re interested. Our cooking retreat at Trigonos in September is in the planning stages, more information coming soon. Here’s some photos of our last event at Trigonos, we can’t wait to see some of you in September, we’ve so many exciting plans. Let us know in the comments below if you like the look of this dish, or get to try it out. 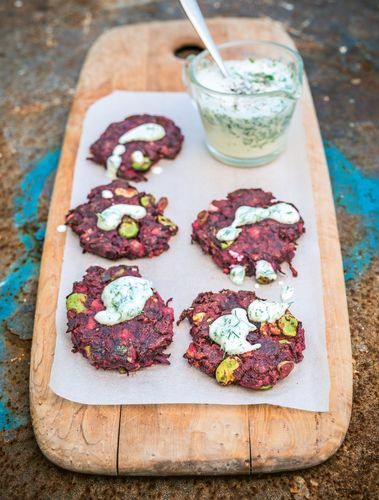 We hope you are all well and feeling inspired to cook some fresh and colourful plant-based dishes. We’re always here to support you if you have any questions. Make sure you cook the vegetables on a high heat for a short time, something like a stir fry. 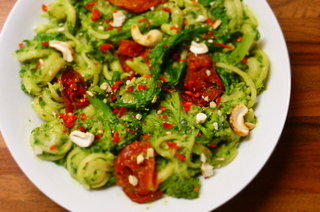 The tomatoes and broccoli will get slightly charred, bringing out the flavours. 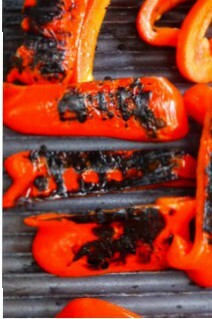 Quick and hot will mean the vegetables cook, but don’t get too soft, we seal in the flavours and retain their vitality. Use any olives you like, but I love the flavour and texture of Kalamata olives. Make sure they’re de-stoned to avoid any unwanted brunch-based crunches. This makes a great lunch or dinner, serve with cous cous or bulghur wheat to bulk it out and make the meal more substantial. I sometimes make a double batch of the chickpeas and keep them in the fridge or freezer, they’re so versatile. Use them as part of a Mexican/Indian meal for example. If you re-heat the beans, add a splash more water to the pan to stop them sticking. For the Smoky Chickpeas – Add all the ingredients to a small saucepan. Warm on a medium heat, cooking for 10 minutes, stirring regularly. Taste and season with salt. For the Mushrooms – Trim off the woody ends of your broccoli. In a large frying pan, add 1-2 tbs olive oil, warm on high heat. Add the cumin and fresh thyme, then the mushrooms. Fry for 3 minutes, turning the mushrooms once. Add the broccoli, tomatoes and olive brine/ water. Stir and toss the vegetables and cook for 3 more minutes. Add the olives to the pan and warm for 2 minutes. Season with sea salt and pepper. 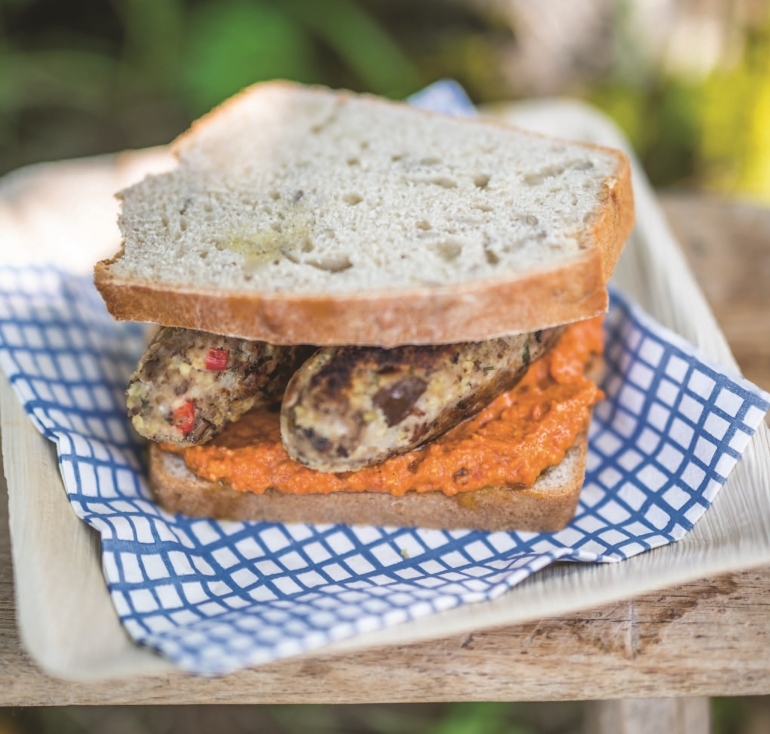 Serve straight away with hummus and toasted pitta bread. In the Trigonos poly tunnels, not much to see yet, but give it a couple of months…..
Chickpeas, aka gigglebeans, aka garbanzos, aka the Egyptian pea, are probably the best named legume. What do you reckon? It’s a very good idea to eat lots of chickpeas, or at least, enjoy them regularly. Full of protein and fibre, some calcium, magnesium, potassium, iron….. Plus they just taste fine, I’ve been making cakes with them!! 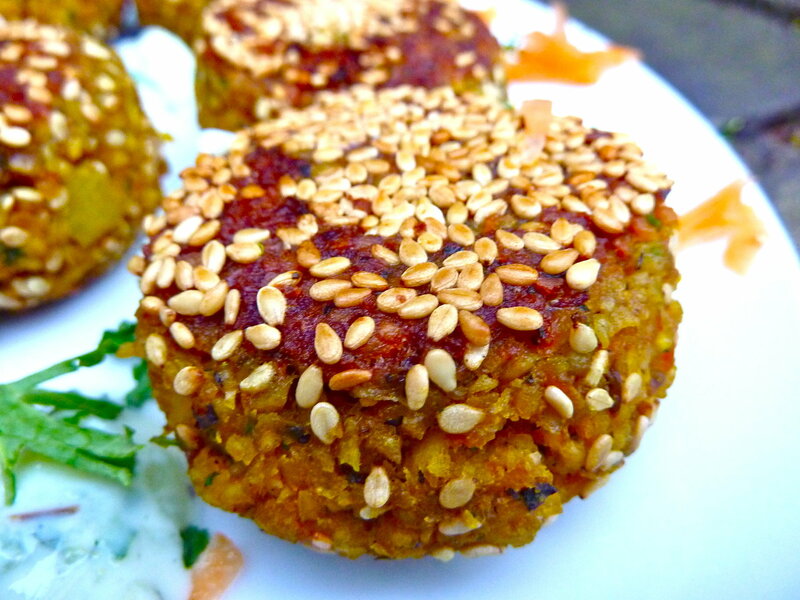 There is no end how awesome and versatile the humble chickpea can be. Vegan Soda Bread Muffins, it’s all about the buttermilk! Home-baked bread in no time at all!! Perfect with a nice bowl of soup. I’ve been busy away from the blog recently, so it’s great to be back! Thought I’d get started again with something simple and hearty. 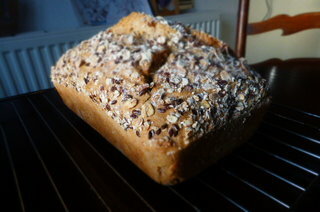 I love soda bread, good bread doesn’t need to be fiddly or take ages to make. These muffins are wholesome, have a great flavour and texture from ingredients you’ve probably got tucked away in your cupboards right now. Soda bread is easy when you know how. We don’t want to taste any soda (bicarbonate that is) so we balance it with the flavour of the buttermilk. That’s the art of soda bread. The acid in the buttermilk help the loaf to rise. We use plain flour here to give the soda bread lighter texture. Soda bread is unique! At work I was asked, why are you always making things into muffins? It’s a good question. I do like a muffin! We make fresh loaves everyday so it’s just changing things up a little. These will be paired with a nice Winter Roots and Lentil Soup at the minute on my menus. 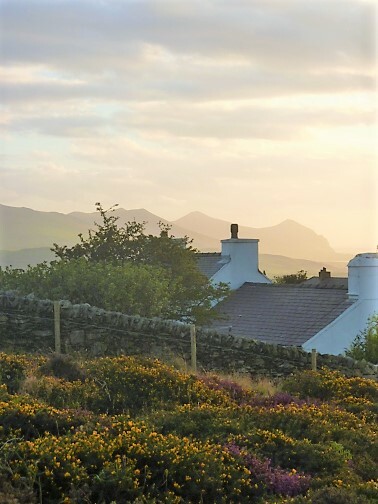 All hearty and satisfying, here’s why we need this (see below – view from near the kitchen over Nantlle Valley towards Mount Snowdon). I think with a muffin like this, it’s also about the crust. It’s a wrap-around crust! Crust all over. This is a definite bonus when it comes to muffins or rolls. You can add all kinds of herbs (rosemary and thyme), nuts or seeds and spices to this bread. You can also bake it in a loaf shape, just add a little more time to the bake. Simple Vegan Soda Bread – Ready in 45 minutes. Making vegan buttermilk is very easy and ideal for baking. I like to use vinegar as the acid, and soya milk. 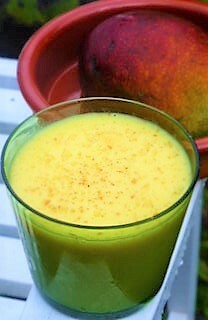 But you can experiment with acid’s like lemon/ lime juice and other plant milks, like almond. But other plant milks may not curdle. I recently announced the dates for our autumn Vegan Cooking Holiday at Trigonos, see below. 21st-24th September! We’ll be hosting you in beautiful Snowdonia, expect lots of delicious plant-based food, inspiring cooking workshops and talks, walks, yoga and lots more. If you want to get away from it all, relax, recharge and energise, do let us know. It promises to be a celebration of good livin’ and the abundance of autumn! Lots and lots of amazing local produce. I’ll be announcing the full details soon. If you can’t wait until autumn:) We have one room available for our annual and stunning Vegan and Yoga Retreat on the beach in Spain. 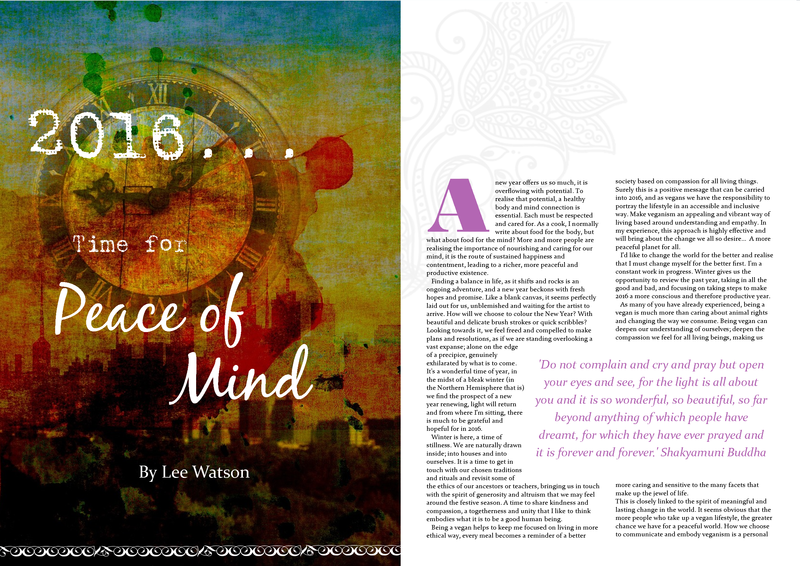 A Taste of Bliss – Click here for more information. It’s a once in a lifetime experience and I’m getting the menus together this month. 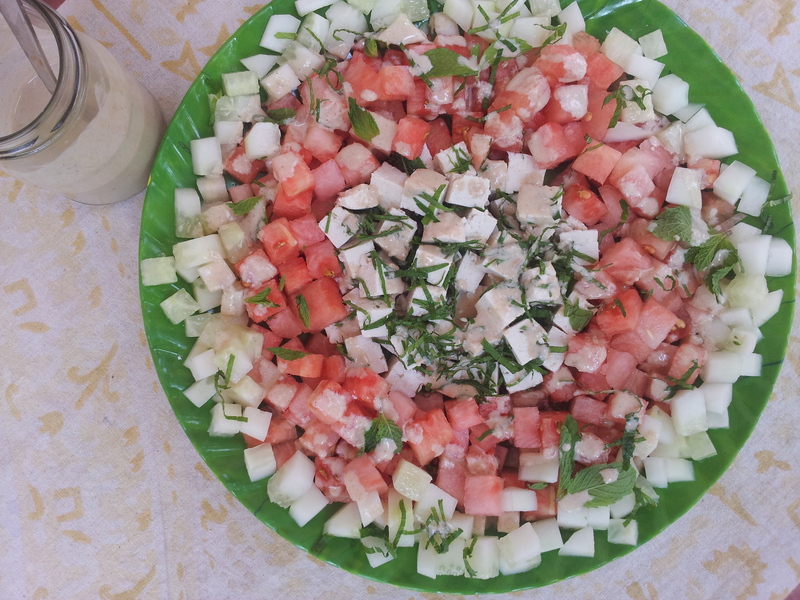 Expect new and creative dishes for you to enjoy, and learn how to cook, in our beautiful beach side villa. We’re very excited indeed!! We need loads of hearty and warming dishes at this time of year, I hope you like these muffins. Do let us know if you make them and feel free to ask any questions or give feedback in the comments below. You can go wholegrain 100% here if you fancy. Just replace wholegrain flour with the white flour. The texture will be a little more dense, but tasty. Make sure you give the mix a good stir, this helps to create a nice texture. Stir the vinegar into the soya milk and leave to sit for 10 minutes. It will form a buttermilk texture. Preheat a fan oven to 180oC. Place all the dry ingredients in a large mixing bowl then mix in the buttermilk. Mix well for a few minutes, I like to use a wooden spoon. Lightly oil a muffin tin and using two dessert spoons, this is the easiest way, spoon the dough into the tin. Make the muffins roughly equal in size. Sprinkle with oats or a little more flour and place in the oven. Bake for 14 minutes. Once baked, they’ll be nice and golden on top. Leave the muffins to sit for a couple of minutes in the tin and then remove onto a wire cooling rack. Best enjoyed warm with a nice bowl of soup. Also nice with your favourite jam and vegan creme fraiche. Trigonos in Snowdonia – a pretty stunning place to cook. You can come and join us here in September! Wholegrain flours are less, or not, processed at all. Wholegrain flour is much higher in fibre than white flour, fibre is essential in our diets for loads of reasons. 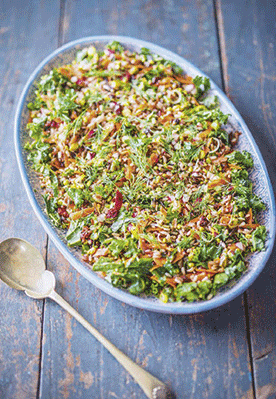 Good levels of fibre in our diets will help our digestion, can lower blood cholesterol and even help to lose weight. Wholegrain flour has roughly six times more fibre per serving than white flour. Wholegrains are low GI, meaning they’re great fuel for our bodies, releasing sugar slowly into our bloodstreams. We’re also talking vitamins; some vitamin B’s, folate, riboflavin. This is a really easy and great looking tart with flavours that just rock!! Bourbon, pecans, seasonal apples, warming spices. It’s got lots of wintery flavours, but is quite light and crispy too. The fruit in the tart can be changed, it’s a seasonal sweetie! I normally prefer experimenting in the kitchen, but some recipes I just go back to and this is one of them. When I go travelling, here and there around the world, one of the things I miss is a proper British apple. They really get us through the winters, especially when desserts are needed, so many amazing apple recipes. Crumbles are, of course, very important. But, this type of tart just changes things up a bit. How has your 2019 started? We’ve had a quiet one, some beautiful walks up in the snowy mountains around here. They look stunning, much bigger, with a white dusting on top. 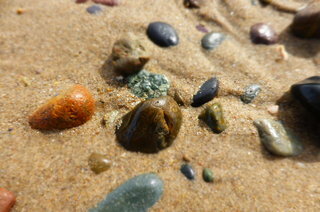 Down at Black Rock Sands beach today, it was fierce. The waves were huge, roaring in, with bitter winds. It is a beautiful sight! What kind of recipes would you like us to post on the Beach House Kitchen this year? We’d love to know. Let us know if you get to get baking, we’ve also got over 200 recipes right here for you if you’re looking for vegan cooking inspiration. The tart in the picture is a smaller version, which I like, especially if you’re not cooking for lots of people. Just cut the pastry in half, width ways. This tart also works really well with pears instead of apples. My friend loves Sailor Jerry’s rum, use rum here instead of bourbon, for that spiced rum thang! Best to use quite a firm and acidic apple here if you can. Something that won’t go mushy when you bake it. The bourbon is not essential, if alcohol is not your thing. The marmalade with the spices also makes for a top glaze. Puff pastry can be bought frozen, and will just sit in the freezer until this tart comes calling. It’s a great standby to have tucked away. Roll out the pastry onto a baking tray, lined with baking parchment. Carefully score a 1 1/2 cm border around the edge, using a sharp knife. Do not cut all the way down to the bottom of the pastry. Prick the rest of the tart base with a fork, to make sure it doesn’t rise too much. Pop in the fridge until you’re ready to bake it. Preheat an oven to 220oC and bake the pastry base for 10-12 minutes, until the base is lightly golden on top, but not fully baked. It will puff up, set it aside, the pastry will deflate and settle down. Toss your apples in the flour, sugar, salt and cinnamon. Arrange in overlapping rows on your tart base, inside the border/ crust. Try to make them neat and tidy and ensure the whole base is covered with apples. Pop back in the oven and bake for 15 minutes, until the apples are soft and the pastry is nicely cooked. Put the orange glaze ingredients into a small saucepan, gently heat until the marmalade melts, forming a thick syrup. Set aside, keep warm. Once the apples are cooked, liberally brush the tart and edge with your warm orange glaze, pop back in the oven for 5-7 minutes-ish. The glaze will mean a lovely caramelised finish on your tart crust. Keep an eye on it, the glaze will caramelise quickly. Decorate the tart with crushed pecans and I like to add some of the spices, star anise, cloves. They look cool! 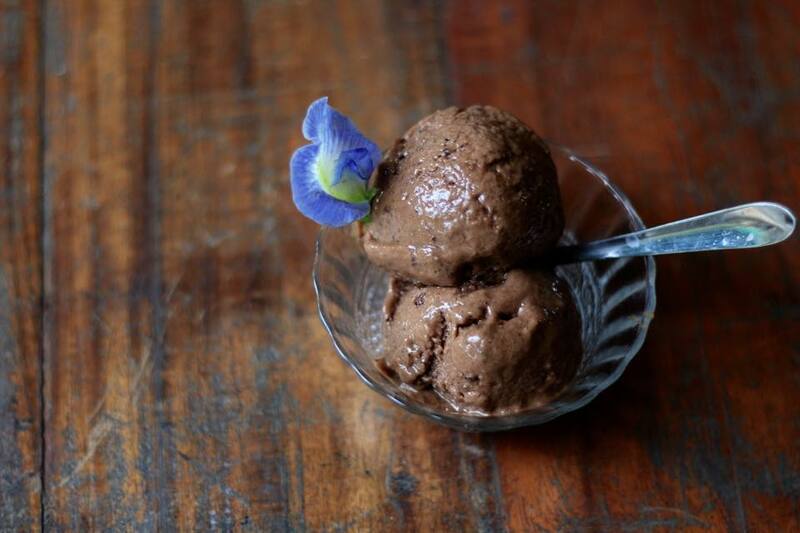 Serve warm with vegan ice cream or your favourite vegan cream. I eat at least an apple a day, sometimes two if I’m feeling adventurous. They contain good amounts of fibre, vitamin C and other anti-oxidants, and may well help lower blood sugar levels and keep our hearts healthy. Always best to give you apples a good wash, but try to leave the peel on whenever possible. Come and join us for relaxing times in a stunning eco villa right on the beach. The week will be filled with delicious plant-based food (we’re cooking! ), empowering yoga, coastal walks, a boat trip to a picturesque cove, food market visit, sunset drinks on the terrace, Jane’s morning smoothies and more. A chance to totally unwind in a peaceful and beautiful environment. COME AND JOIN US SOON IN BEAUTIFUL SPAIN. 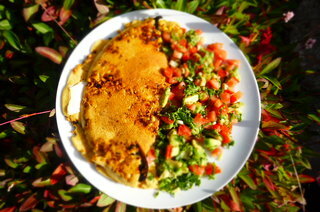 A MEMORABLE, LIFE-CHANGING WEEK AWAITS, FILLED WITH DELICIOUS VEGAN FOOD! Join us in a stunning beach-side villa for a transformational yoga and vegan cooking holiday. 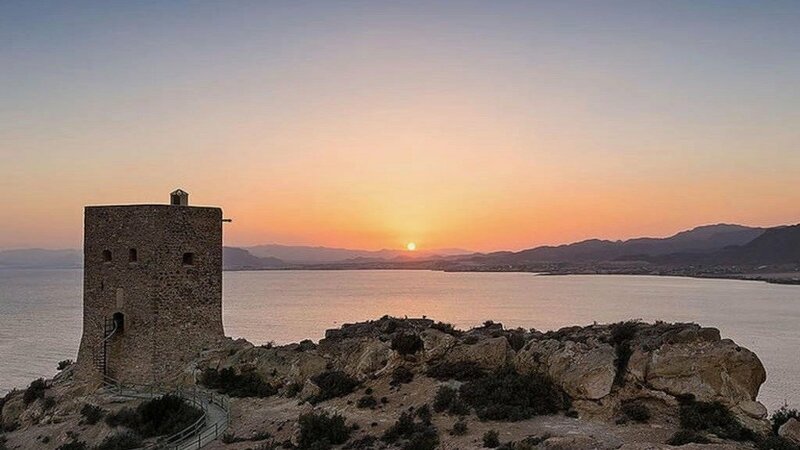 Set in the Costa Calida, the jewel of the Spanish coastline, we have arranged a carefully crafted program designed to fully nourish mind and body. A Taste of Bliss Yoga Holiday is bursting with inspirational workshops, delicious plant-based food and life-enriching experiences. Wander along the stunning beach, unwind on the villa’s sunny terraces, go swimming in the deep blue sea or join excursions to explore the fascinating local area. This promises to be an unforgettable week. Enjoy time, space, and guidance, to find inner peace and harmony, whilst learning new healthy habits to live a passionate and an enriched life, full of joy and well-being. 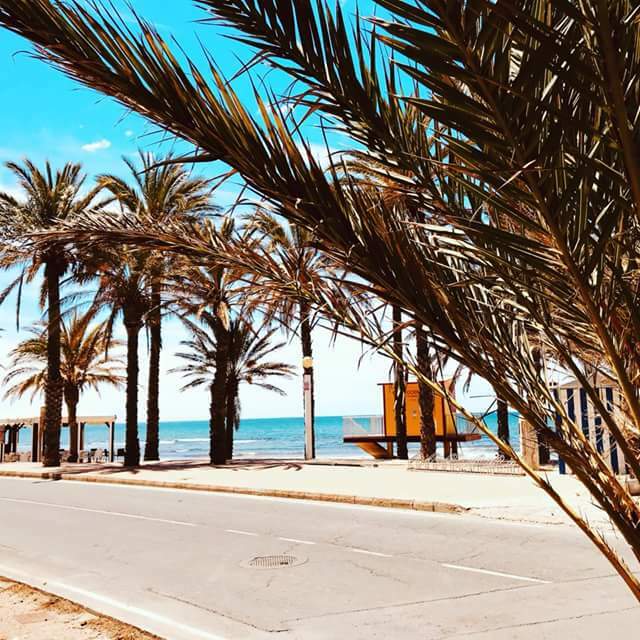 Retreat Leaders: Will Fisher and Malene Vedel senior teachers and founders at Complete Unity Yoga will host this amazing yoga holiday in Spain with Jane Legge and Lee Watson from the Beach House Kitchen. 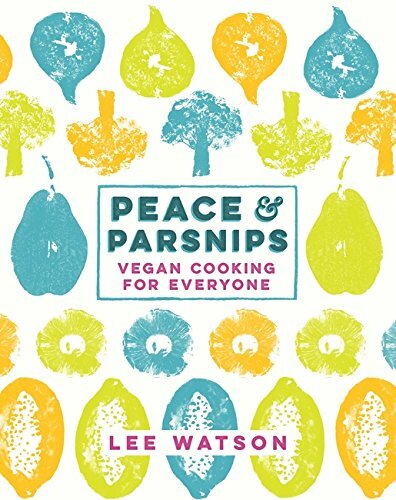 Check out Lee’s cookbook “Peace and Parsnips: Vegan Cooking for Everyone” here! A wonderful week of Bliss! “Wow, what a fantastic week this was! 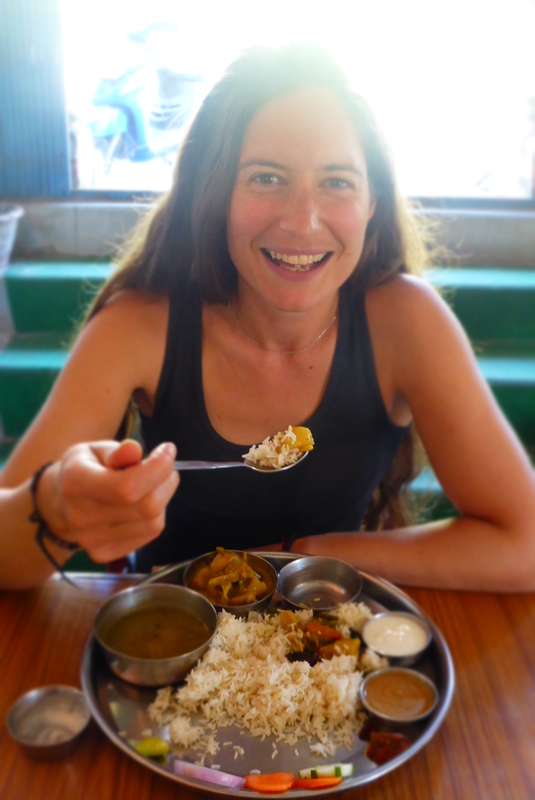 I had been searching for the ‘right’ yoga holiday and this turned out to be exactly what I wanted, needed … and more! I am just embracing a vegetarian lifestyle and was amazed by the gorgeous food Lee of ‘Beach House Kitchen’ demonstrated and created lovingly for us 3 x daily … plus snacks! and the chocolate fudge cake was the best I have tasted … ever!! 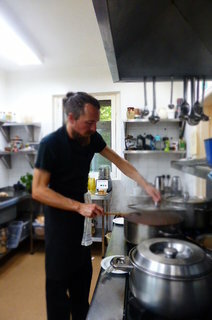 Lee is a lovely upbeat guy and such a creative and enthusiastic chef and Jane is his joyous assistant, who also lead us on some pleasant local beach walks, and delivered a very interesting, meaningful, moon cycle’ class. Lovely Will and Malene from ‘Complete Unity’ are also a confident, happy, knowledgeable couple and gave us the most fabulous yoga classes and meditation sessions twice daily, usually on the terraces to enjoy the balmy sea air … so calming, uplifting and enlightening, appropriate for all levels of experience. I also had a wonderful massage from splendid local therapist Carlos, kindly arranged as a last minute extra. Everyone on the holiday were relaxed in each other’s company and all of us want to book again for next year! If there is one retreat that to go on then this is it. “What can I say about this experience. It was wonderful in so many levels. The people I met were all different and contributed to making this a fantastic experience. 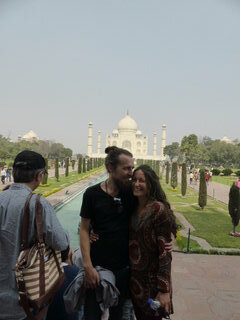 Will and Malene are gold star Yoga and meditation leaders their youth and exuberance just fills you with joy and love. “This retreat absolutely lived up to its name in so many ways. 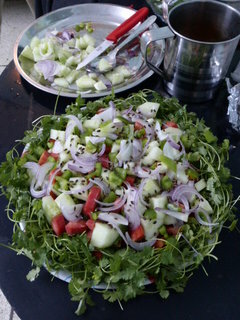 The food was simply mouth-watering and wonderfully nourishing. It was definitely the best vegan food (actually any food) that I’d ever eaten; beautifully presented and made with so much love by Lee and the team. 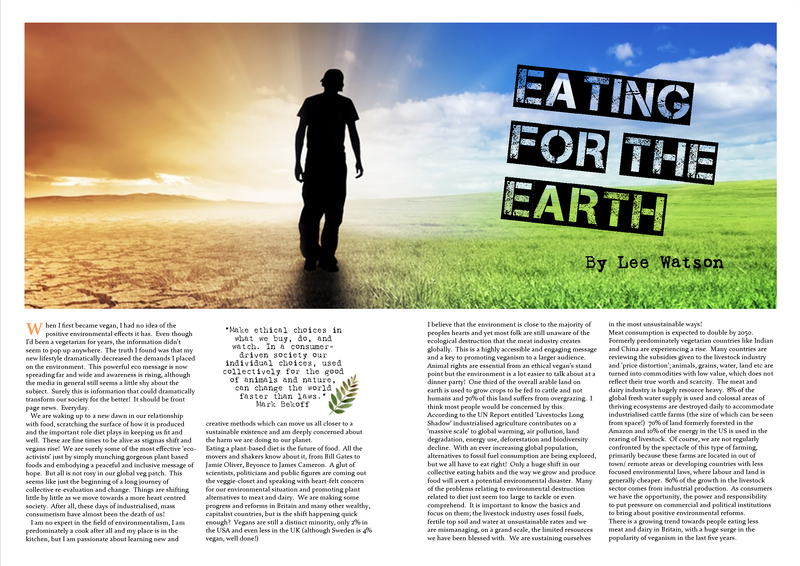 Lee Is passionate about plant-based food and was incredibly generous in sharing his wisdom and knowledge with us. The morning smoothies made by Jane were an absolute highlight too! Will and Malene are an incredible team when it comes to teaching Yoga. They both totally embody their practice and their love and passion for yoga shines through in their teaching. They are so full of wisdom and knowledge and again, were so generous in their sharing of it. Will and Malene are very wise old heads on young bodies. We had a wonderful variety of classes out on the terraces overlooking the sea. The sound of their rich voices, beautiful movement sequences and meditative practices combined with the warming sun and the sound of the ocean was indeed blissful. The yoga was suitable for all levels – carefully crafted so that everyone got what they needed from a class. We were always encouraged to listen to our own bodies. Something quick and easy to kick start 2019! A simple, healthy and delicious soup with some of the Thai flavours I totally love. This is how I’d like to kick off 2019, a steaming, bright and nourishing bowl of goodness. Red peppers are packed full of vitamin C and after the festive season, I’m sure a lot of you fancy a pick me up, tasty dishes that are lighter and give our body a big hug. Comfort food can be healthy and satisfying. No probs. This soup contains coconut, chickpeas, turmeric, ginger, loads of my favourite foods. Bar the Kaffir lime leaves (see below) and lemongrass these are easy to find ingredients, that many of you might have in the kitchen already. Of course, January is now officially Veganuary, they’ll be changing the calendars next year for sure! If you’re trying out Veganuary, you’re not alone, record numbers have signed up worldwide this year. I even saw it all over the TV around New Year’s, right there, bang in the middle of prime time programmes. 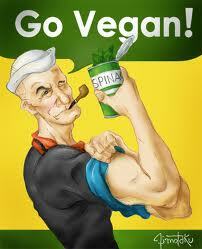 Just awesome to see a vegan lifestyle skyrocketing, being embraced and enjoyed! The people over at Veganuary have always been lovely to us and we even have some recipes over on their website, check them out here. Good luck to anyone giving it a go and long may your vegan-ness continue! Let us know if you need a hand or some advice, we’re fully available for pats on back, big thumbs up and bags of encouragement. GO FOR IT!! What are Kaffir Limes? Why are they so awesome!! Dried kaffir lime leaves can be found in most supermarkets. I buy them frozen in a local Chinese supermarket, these have been frozen fresh. They are much better than the dried varieties, but you can use either in this recipe. I’ve been lucky to travel around South East Asia and work and stay in some beautiful places, some even had kaffir lime trees. The limes themselves are like big, nobbly limes, with thick piths, very fragrant. The leaves can be used in all kinds of cooking, it’s essential oils are use in perfumery, and it’s really like a bay leaf with an Asian turbo charged twist. Their flavour is unmistakable! When I worked on an organic farm in India, I’d wake up, pick a few leaves and make a refreshing tea with them, watch the lizards and mongoose chase each other. Eating peppers at this time of year means we have a great source of vitamin C. Peppers are said to be three times higher in vitamin C than oranges, red peppers are best, but green peppers also contain good levels of vit C.
Jane and I have been spending time with family and friends over Christmas, we’ve been to North Yorkshire and Durham mainly and really love the time away with the people who rock our world!! We’ve actually not stuffed ourselves too much! We both feel like we’ve lost weight over Christmas, which is pretty unusual. I go back to the fact that freshly cooked vegan food can be so, so healthy and tasty. We’ve had many positive comments over Christmas, so many non-vegans digging the food. I feel like 2019 will be the greatest year for vegans in the UK EVER! 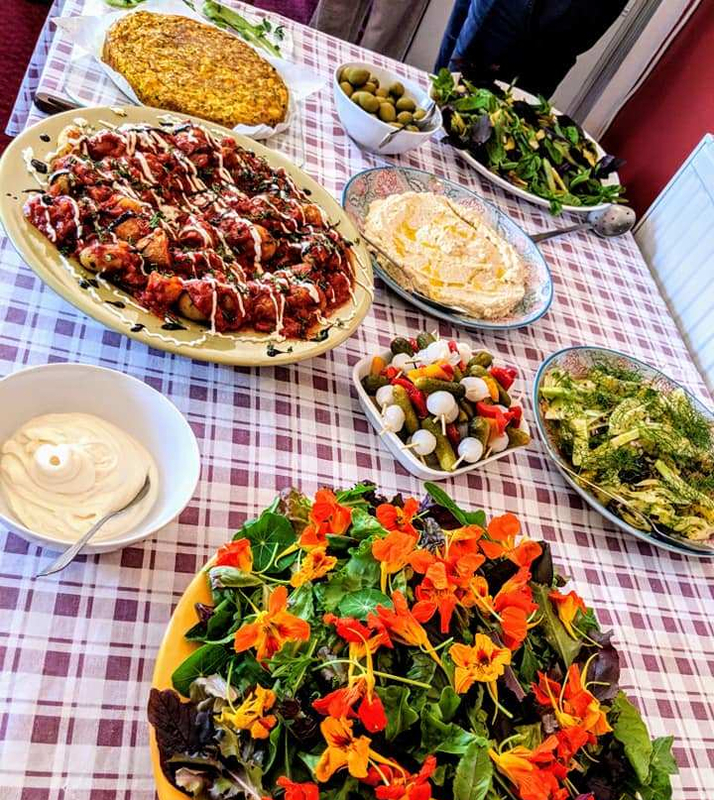 We have some great plans, we’ll be hosting our vegan cooking week in Spain again (click here) and will be announcing new dates for events and holidays in Wales soon. Exciting stuff and we hope to see you at one soon! Keep up to date with all our news, recipes and other bits and pieces by signing up for our seasonal newsletter, right here. Big thanks to all who cooked our recipes over Christmas and New Years and let us know, it was great to see pictures over on Twitter and Facebook, it makes our day!! 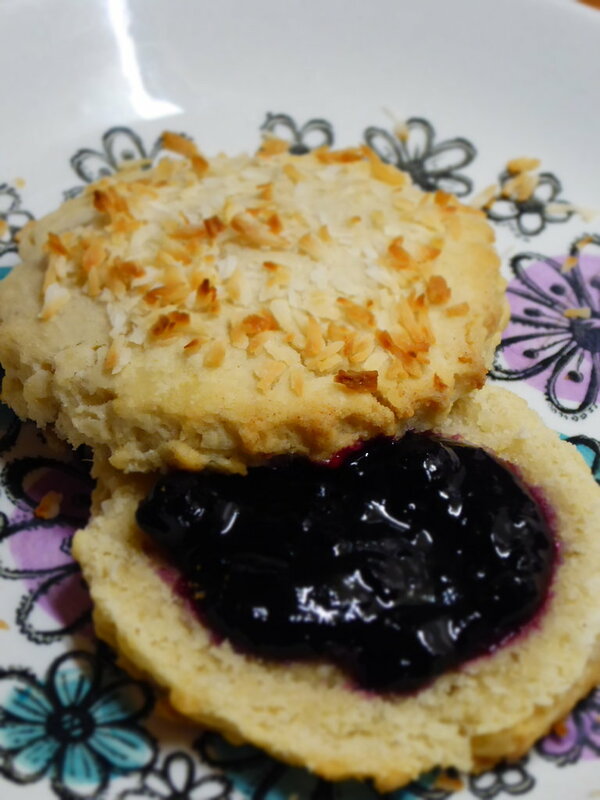 We love to see your kitchen creations, you really bring our recipes to life!! You may like to pick the lime leaves out before you blend the soup, but I generally leave them in. Use the softer, centre piece of your lemongrass. Discard the tough outer leaves. You’ll find lemongrass in most supermarkets. In a large saucepan, add 1 tbs cooking oil, fry the onions and ginger with 1 teas salt until soft, 3 minutes will do. Then add the carrots, chilli, lemongrass and peppers, fry for 5 minutes, then add the tinned tomatoes, chickpeas, kaffir lime leaves and turmeric, bring to boil and simmer for 10 minutes. Then add the coconut milk and simmer for 5 minutes more, until the carrots are soft. Blend with a stick blender then season with salt, if needed, and adjust the consistency using hot water if it’s too thick. 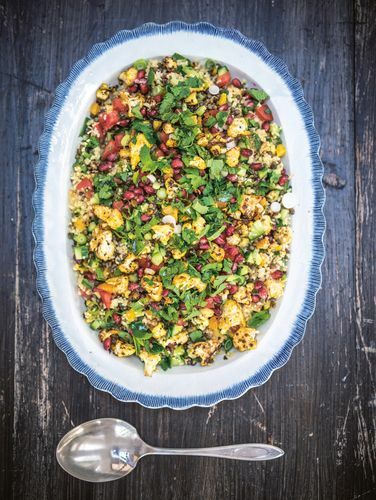 Serve with chillies, coriander and lime wedges. We also love it with sticky coconut rice balls. Kaffir lime has many uses in Asia, not just for the pot! The lime juice makes a great shampoo, the plant is a natural insect repellent, when used in aromatherapy kaffir lime is relaxing, can reduce stress and help with a good nights sleep, also many people chew the leaves, it is said to help with oral health. We just wanted to say a huge thanks and best wishes for 2019! But first up, 2018, what a year!! It’s been a mega time, we’ve packed so much in, cooked in so many amazing places and met so many special people along the way. You know that we’re all about tasty and healthy plant-based food, but it’s also, very much about YOU. The kind and open hearted folk who make it all happen, give it all such a positive and creative feel. 2018 has been the most successful year for the Beach House Kitchen blog, in more ways than one, and the most enjoyable and rewarding part of the whole thing is connecting with and sharing recipes with you all. You make this blog and our Facebook and Twitter pages a great place to be and inspire us to keep sharing and enjoying what we do. Thanks to all for your amazing feedback over the festive season, seems a few of you enjoyed the Mushroom Wellington!! Wishing you all health, wealth and happiness in 2019, we’ll be here with healthy and delicious vegan recipes and plant-based updates, if you’d like to join us for one of our vegan cooking events, holidays, demonstrations or talks, CLICK HERE. We’ve loads of cool plans for the new year. What have we been up to in 2018? From our Taste of Bliss Cooking and Yoga Holiday in stunning Spain, to our Cornish Vegan Getaway near Lands End, to the centre of London and the awesome Made in Hackney. We’ve had events all over North Wales and in Manchester, not to mention our annual cooking demos and talks at Ludlow Food Festival. In 2019, we’d like to visit new towns and cities, give us a shout if you know any good venues/ locations. Will (ace chef and proper dude), Clare (North Walian Yoga sensation), Complete Unity Yoga – Will and Malene (simply stunning yoga folk), Jenna (super talented angel), Mark and Food Sorcery (top venue in Manchester), Sue and Peter at Network News (ever the inspiration! ), Andi and Made in Hackney (top venue in London), Thelma and Boswedden House (Cornwall), Janice (fermented genius and overall foodie angel)….. The lovely Aine Carlin, Veganuary, Alice and the gang at Tyddyn Teg Organic Farm, Mandy (sensational vegan chef), Amy (superb kitchen elf), Nita and Steve (THE kitchen guys), Katie and Glynn (Wot’s Cooking), Mark (foraging genius and top cook), all at Ludlow Food Festival and Aadvark Books, all at Trigonos Retreat and Event Centre for letting me cook and enjoy the beauty of North Wales, Jonathan (my very patient book agent, new cookbook coming in 2019!!)….. all who have attended our events and cooked up some brilliant memories in 2018! It’s already been said that 2019 will be the ‘Year of the Vegan’ and we’re here every step of the way to support and inspire you to cook more plant-based meals, always believing that vegan food can be delicious and accessible to everyone! Recipes here. PS – Last, but very much not least. The WILL’s!…. See you all in 2019 for more fun, cooking and celebrating the good life! Fancy a blissful break with us in May 2019! We’ll be hosting a week long vegan cooking holiday with empowering yoga, a fully plant-based menu, cooking workshops, local excursions, lots of beach time and sunshine, plus much more. More info here. All you need now are some roast spuds and your favourite people!! A rich, dark vegan gravy that everyone will enjoy. 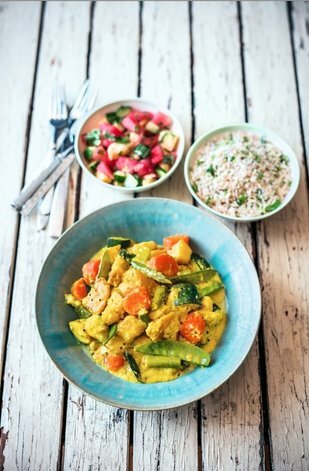 Being a vegan, or just trying out more plant-based recipes, opens a doorway into new flavours and techniques. Making this gravy is simple and really flavourful, it’s actually not that different from making other gravies really. We all like our gravy in different ways, taste it at the end, add more balsamic, jam, salt or yeast extract (marmite), depending on the balance of flavours you prefer. If you can’t get your hands on shallots, a white or red onion will also be fine. Making your own gravy is an essential part of any roast dinner, for me, it’s a ritual. I love making gravy, packing all those big flavours into one little pot. Gravy has always been one of my favourite things about a proper Sunday roast, I also like mashed swede (very important addition) and crispy roast potatoes. Yorkshire puddings are also well up there. In fact, let’s face it, is there a less than awesome part of a roast, when done well? We’re having this gravy with our Portobello Mushroom Wellington with Toasted Walnut and Rosemary Stuffing, Christmas dinner 2018 sorted. This deep and rich gravy will go perfectly with any Sunday roast. There are so many vegan centrepieces nowadays for a Sunday roast style dinner, we don’t just have to toss a coin between nut roast or Wellington. Sometimes I feel like experimenting with a roast dinner, playing with flavours, adding spices, getting a bit cheeky. Other times, I’m a staunch traditionalist. I’m happily contrary like that. Such is my commitment to the Beach House Kitchen, I took these pictures out in the garden in fading winter light, in the rain and wind. Wrapped in a poncho. I’m actually surprised at how normal they look whilst trees were bending and the wind was howling. Got away with it! I just had to share this post before Crimbo, gravy is important!! I’ve said it many times, there are absolutely no down-sides to going vegan, you can live deliciously, any time of year! When I run cooking workshops, most people’s reaction to making a really tasty gravy like this is, “What do we do with all the leftover veg? !” After the gravy has been passed through a sieve, the veg is all leftover. I’ve suggested making a pastie or pie with it, but really, most of the flavour and texture has gone, it’s like a dark veg mash really. Not that appetising, but if you want to, go for pasties! Gravy is, of course, always best served piping hot, a tip is to pour boiling water from a kettle into your gravy boat/ jug before filling with gravy. Taste your vegetable stock before adding to the soup, it’s important it’s not too strong or too weak. Just right! If you feel that the gravy is lacking flavour, add a pinch of salt. It’s amazing the difference one or two pinches of salt can make! Gluten-free version – opt for gluten-free cornflour, yeast extract, wine, balsamic vinegar and vegetable stock. Check the labels. In a large saucepan, over a medium heat, add 1 tbs cooking oil, then the shallots, celery and carrot, plus the fresh herbs and bay leaves. Cook slowly for 20-25 minutes, until the shallots are golden, stirring regularly. Mix your cornflour with a few tablespoons of water, until it becomes smooth. Add the mushrooms, wine and jam to the pan, stir and cook for 3 minutes, making sure your scrape up all the caramelized bits on the bottom of the pan (great flavour there!!). Then add the tomato puree, vinegar and yeast extract, cook and stir for a minute, then slowly add the vegetable stock. Pour in the cornflour, whilst stirring, and bring to a boil. No lower the heat, simmering gently for 20 minutes. Pass it through a sieve into another pan or bowl, using a spoon to squeeze out all the precious flavours. Taste and season with salt if needed. Serve hot with your favourite roast dinner of Christmas feast. Loads of big flavours in one little boat, totally plant-based gravy!! Shallots are long and slender members of the allium family, along with onions and garlic. They generally have a lighter flavour than onions and I find them perfect for roasting in a tin. They are more nutritious than onions, high in vitamin A and not bad for vitamin C. Shallots contain good amounts of minerals like iron, calcium and copper. They also contain a chemical called Allicin, which is basically anti-bacterial anit-viral and good for the heart and can even help prevent cancer. Join our seasonal newsletter right HERE, we’ve got loads of tasty recipes and events planned for 2019. Plus special offers and news about our new Beach House Kitchen projects. I fancied something different this Christmas for dessert. I wanted the flavours, the spice, the mulled fruits, the richness, but all mingling together in a different way. So I wrapped them up in a big brownie, with lots of chocolate. It just seemed like the right thing to do! This is a decadent brownie cake, very rich, with lovely taste explosions coming from the mulled berries. Best served warm with vanilla ice cream I’ve found, or whipped coconut cream is also very special. Plus, it’s a big brownie, so it’s easy to make. You could use any dried fruit really in this recipe, but I prefer, and if you can get them, dried cherries, blueberries or the classic cranberry. If you don’t drink alcohol, you can cook the berries in orange/ cranberry juice or non-alcoholic wine. I have cooked the mulled berries with a few cloves, star anise and cinnamon. But I found that it was a fiddle trying to pick out all the spices, they do add some flavour, but we’re just cooking the berries quickly and there is plenty of cinnamon in the cake. But, by all means, add the spices. I love the way cinnamon seems to blend and deepen the the flavour of the dark chocolate. As a cook, I find myself naturally drawn to flavour combinations, sometimes I have to resist, in order to try something new. Cinnamon, orange and dark chocolate is special trinity of good things in my eyes. I do like a Christmas pudding and I’ve always loved Christmas cake. Mum used to bake it in early December and I remember the whole house filled with those beautiful, spicy cake aromas. But they’ve very much like Christmas pop songs, I don’t mind them once or twice in a year, but anymore makes me feel a bit sickly (see my post on Alternative Christmas songs here ). But this brownie cake, I’d happily tuck into in the roasting heart of August. It also makes the house smell pretty damn good too. Jane was a big fan of Terry’s chocolate orange, so I have added a twist of orange here. It’s a match made in lapland or maybe the Swiss Alps!? Now Terry’s is off the menu, I go for a very dark chocolate flavoured with orange, there are some awesome bars out there. If only they made them in little globes with segments. That’s where all the fun is. The idea as a kid that chocolate oranges could maybe grow on trees just made Christmas even better. The thing about cooking at Christmas is preparation. Cook things well in advance and have a plan. I’ll be posting some Christmas cooking tips and a full cooking plan in the next couple of days. However, I think this brownie is best served warm, recently taken from the oven. Leave it to the day, along with your veggies. I hope you love this recipe and it woo’s and yum’s the whole family, and all your friends and neighbours and people at work. Who doesn’t love chocolate cake (actually, one of our bestest buds doesn’t like chocolate cake, but generally speaking, it’s a HIT!) If Christmas is not your cup of tea, or it’s a hard time of year for you, cake is never a bad thing right! We send you all our love and good vibes at this time of year, a time to eat, drink and snooze by a fire. Have magical and delicious Festive Time 2018! Any questions or comments? They are very welcome down the bottom there in the comments. Drops us a chat or just say hello. Sign up for our seasonal newsletter here (loads of cool stuff coming in 2019) or check us out over on Facebook. You might like to decorate it with dried orange slices, I’ve added the method below. They also make for nice decorations. If you’d like to go very decadent (steady!! ), I’ve also added a link to my quick chocolate sauce recipe below, which is ideal for a chocoholic, maybe a little brandy could sneak in there too. I do mention this below, but please don’t overbake this. If you’re wondering where to get vegan cream or ice cream, you’ll find it in most supermarkets now, and supporting your local health food shop is a wonderful thing too. They’ll have it. I know what you may be thinking, that’s a lot of chocolate. It’s Christmas!!! Just add cream or ice cream…. Boil a kettle. Preheat a fan oven to 180oC. 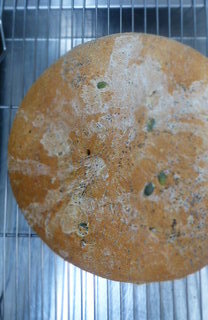 Grease and line a large round cake tin (23cm) with oil and baking parchment. Mulled Berries – Place your dried fruits into a small saucepan, pour over the brandy, squeeze the juice out of the orange slices and toss them in too. Bring to a boil and leave to simmer for 3 minutes. The berries should absorb almost all of the brandy. Set aside to cool. Remove the orange slices and any orange pips. Break your chocolate into a bowl, pour the boiled kettle water into a small pan, place the bowl on top and gently warm the chocolate. Stirring regularly until it’s melted. Don’t let the base of the bowl touch the boiling water when cooking. Set aside to cool a little. Place the flour, baking powder, cinnamon, cocoa, sugar and salt into a large mixing bowl, mix well together. In a bowl/ measuring jug, stir together the oil, soya milk and vanilla extract and then pour this into the bowl of dry ingredients, along with the cooled melted chocolate. Finally add the mulled fruits (with any leftover brandy) and orange zest, fold into the mix. Don’t over mix, just until it’s all combined. Pour the mixture into the tin, fashion a level top, and place in the oven. Bake for 18 – 25 minutes, depending on your oven. Don’t over bake, it should still be a little gooey in the middle when you test it with a skewer. Normally, if you think it’s a little undercooked, that’s fine. Don’t trust your instincts on this one! The brownie cake is ready when a light crust has formed over the whole cake. Leave to cool in the tin, then decorate as you like. Nice and festive! Best served warm, with a scoop of vanilla ice cream on top. Orange slices – Place 6 orange slices onto a wire/ cooling rack and into a low oven (120oC). Cook for 1 hour or more, until they have dried out nicely. It’s Christmas, I’m going to leave out the healthy Foodie Fact this time around. But, I’ll just say this, cinnamon is very high in calcium! Also a good source of iron. And this, cinnamon has been used medicinally for thousand years, it is an AMAZING source of anti-oxidants. Winter is the perfect time of year to get your cinnamon oooon! We love cinnamon tea and it’s so versatile, add it to smoothies, soups and stews. The next time you cook rice, pop a cinammon stick or some cinnamon bark into the pot. Lovely sweet and warming flavours. The perfect Christmas or roast dinner centre piece! 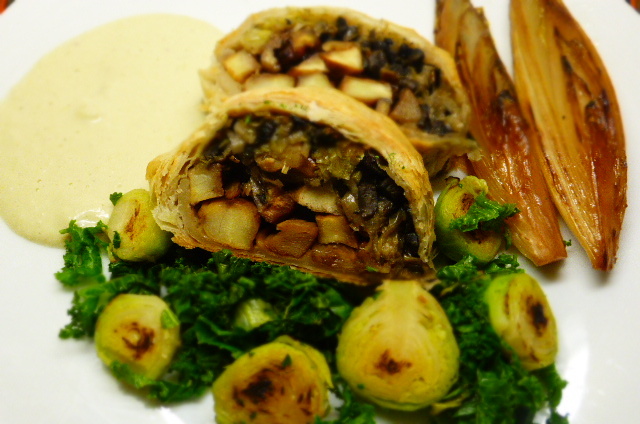 This dish looks lovely, with succulent mushrooms tucked away inside a flavourful nut roast, wrapped in crisp pastry. 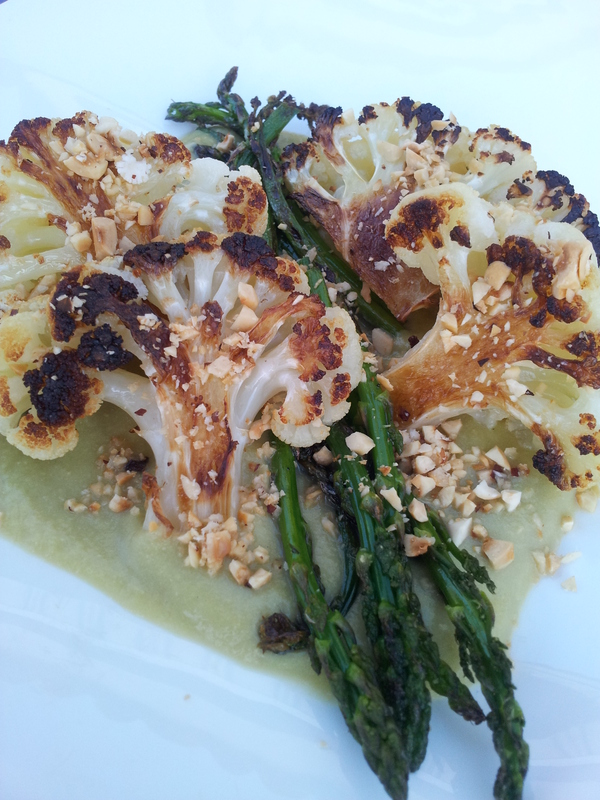 This is the kind of dish that everyone will enjoy, vegan or not. It’s rich with loads of big flavours and textures. This has been well trialed on meat eating friends and family and it always gets the thumbs up. This is my variation of what is fast becoming a modern vegan classic. I’ve been testing the recipe for months now, it’s changed many times. Sometimes a recipe arrives straight away, is bang on and I’m happy with it. Yum! Other times, it’s impossible to not tinker with, or make huge necessary changes that make it edible. The joys of experimenting in the kitchen! I love making this dish, so trying out new things has been a real pleasure. I like the balance of flavours in the stuffing here and I much prefer the mushrooms pan fried, they’re more succulent and juicy. Plus the garlic must be nice and golden, this adds wonderful flavour to the filling. We recently hosted a cooking workshop in Manchester, guess what the main course was?! Here’s some of the team Wellington’s offerings, made by Jeremy (thanks for the pic:), Nicola and Christine. The one closest to the camera had problems in the oven, hence the funky pastry patterns. Plenty of tips below on how to make them perfect and lovely, plus you probably won’t be using complicated new ovens with funny buttons and weird tendencies. We’ve been busy cooking and travelling all over the UK in recent times, spending some cool times in Whistable down in Kent. Great vegan breakfasts if you’re in the area! Plus one of our favourite vegan cafes in the UK, The Wallflower Cafe. Yeah. It’s that hectic but fun time of the year, where everything seems to go unhinged, we all get high on mulled wine and mince pies, waking up covered with tinsel. It does offer so many opportunities to eat like a hungry reindeer! We’re spending the festive period with family in Harrogate and North Wales. It’s great because we’ll be with young folks, they’re already so excited about the BIG day! Plus, I get to play with lego. We’ve both written long letters to Saint Nic. I’ve asked Santa for a frying pan. Jane is expecting a pink watch. No one really knows why this dish is called a ‘Wellington’, it has nothing to do with the Duke of Wellington, although it may well have been created in Wellington, New Zealand. It is most probably a British name for a French classic ‘en croute’ dish. This does look like lots of ingredients and instructions, but once you’ve tried this type of Wellington, it’s a really flexible dish that you can use all year with different seasonal vegetables. It’s easier than it looks. Here’s to a delicious 2018 Christmas lunch! I’ll be posting a dessert and gravy recipe very soon. An ideal Christmas centre piece, Vegan Mushroom Wellington. Notice the different style of folding the pastry. I’ve added two sizes of Wellington below, one for a meal for 6+ people and one for 4. This Wellington can be made the day before, and kept in the fridge. If you have the time, this is a great idea, making your Christmas day much simpler. This dish freezes well. Reheat in a low oven covered with foil. Mushrooms – If you prefer, oyster or a selection of wild mushrooms, they also make a wonderful filling, just swap them for the Portobellos. If you like garlic, fry a clove or two more with the mushrooms. If you like things smoky, add ½ teas more smoked paprika. As ever, this is your dish now, and it should ideally represent your tastes. Pastry – I mention below, but I’ll say it again, the pastry is best used straight from the fridge, nicely chilled, in a cooler part of the kitchen, ideally on a cool surface. This means the pastry is much easier to handle and fold. If it seems too soft, pop it in the fridge again to chill for 20 minutes or so. Cutting the pastry – I’ve tried folding the pastry many ways, the easiest is to cut it at a right angle away from the filling, see directly below. You can cut it at an angle, like in the picture up top and below, it leaves a space between the pastry folds, which can make it easier to cut. But I think I prefer the tucked in, right angle approach. I hope that makes some sense! You can use hazelnuts, pecans or almonds in the stuffing. Just make sure they’re nicely toasted, in a low oven, to bring out all the rich and full flavours. If you are really not a fan of yeast extract (there are many out there!) and cannot even have a jar in the house, go for a dark miso. They both add a great umami depth to the stuffing/ roast. Can’t get really big portobello mushrooms, that’s fine, go for field mushrooms, or just use more smaller mushrooms to add a nice centre for the Wellington. Please don’t be tempted to use dried herbs here, fresh is best for a lighter flavour. If you make the smaller Wellington, you’ll have a little pastry leftover. I normally pop it in the freezer. When blending the nuts and bread, chunks are fine, we don’t want the stuffing too smooth. A rougher texture is best I’ve found. Most puff pastries in the UK shops are vegan, but do have a little check. I’ve found that Aldi is the best supermarket at the minute for vegan wines, many are labeled. Gluten-free – To make this recipe gluten-free and still delicious, just use gluten-free pastry, breadcrumbs and dark miso (soya based) or tamari instead of yeast extract. As ever, you are best to judge what is your level of gluten intolerance. Preheat an oven to 200oC. 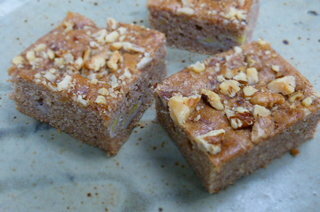 Walnuts – On a baking tray, toast your walnuts for 5-8 minutes. You’ll get a lovely aroma when they’re ready and they will darken in colour slightly. Mushrooms – Using a sharp knife, cut away the edges of your mushrooms and the end of the stem, so you’re left with a flat base. This helps them to fry evenly. Then finely chop the off cuttings, to be added to your nut roast filling later. Warm a large frying pan on medium high heat, add 1-2 tbs of cooking oil, fry the mushrooms, top first. Sprinkle each mushroom with the fresh herbs and little salt and pepper. At the same time and In the same pan, fry you garlic until golden. Once the mushrooms are cooked, around 5 minutes each side, leave to cool with the garlic scattered on top. Stuffing – In a food processor or blender, add the bread. Blitz until a rough crumb forms, not too fine. Pour into a large bowl. Also blitz the chestnuts and then walnuts. Placing all together into a large bowl. In your large frying pan on medium high heat, add 2 tbs cooking oil and fry the onion, celery and garlic, adding 2 large pinches of sea salt. Cook for 5 minutes, add the mushrooms cuttings, fresh herbs, paprika and season with black pepper. Cook for another 5 minutes, until all is nice and caramelised. Then add the red wine, maple syrup and yeast extract, stir, heat through, cooking until the wine is cooked off, roughly 5-7 minutes. Add the onion mix to the large bowl of bread and ground nuts, mix all together until a dough forms, adding 1-2 tbs water, if needed. It should stick together well when pressed between finger and thumb, but should not be too wet. Taste the mix, season with salt if needed. Separate into two even balls, weigh them if you like, to be exact (and like a proper chef person). It is easier to cut and fold over the pastry at a right angle, NOT like I’ve done here. Mushrooms here trimmed and topped with golden garlic. On a cold baking tray, lined with parchment, lay or roll out, a sheet of puff pastry that’s roughly 23cm x 29cm (large), 23cm x 24cm (smaller). Pastry is best used straight out of the fridge and handled minimally. Form half your nut roast filling in a large fat sausage, place into the centre of your pastry, lengthways. Press it down to make a flat oblong shape (see above). This is the base layer for the stuffing filling. Top this with your mushrooms and garlic, face down, trim them if they stick out past the edges. On the picture above, the mushrooms were too big, so I flipped over the middle one to fit it in. Whatever works best, we want as much mushroom in there as possible! Cover the mushrooms with the rest of the mix, moulding the mix and making it smooth with your hands. The mushrooms should be tucked in nice and tightly. Cover and smooth the filling, tidy up any rough edges. This will mean the Wellington has a nice shape and it’s easy to fold the pastry. Lightly brush the soya milk mix around the edges of the pastry, this will help the pastry top to stick together. Make a lattice effect, by simply laying one strip of pastry over the filling, followed by the opposite strip, being as neat and gentle as you can. Continue doing this, when you get to the end, just trim off the last couple of pastry strips so they fit nicely. Now brush the whole Wellington with milk and tuck it all in and make it look tidy. For best results, place in a fridge for 30 minutes or longer before cooking. Then brush again with your milk. At this stage, you can leave the wellington in the fridge overnight. Bake the Wellington for 30-40 mins bake, turn after 20 minutes if your oven is hotter one side than the other. You know your oven. The pastry will be golden brown and cooked right through. Leave the Wellington to sit for 10 minutes before using a sharp knife, or bread knife, to carve the wellington. Serve with your favourite Christmas trimmings. Merry Christmas!! Chestnuts are the only nut high in Vitamin C, which we of course need lots of at this time of year. They’re also high in manganese, and a good source of copper and magnesium. Remember to treat your chestnuts more like a vegetable than a nut, by that I mean they’re best stored in the fridge or somewhere cold. Chestnuts should be plump when you buy them, give them a squeeze. Toasted chestnuts are one of my favourite things about Christmas! But if they’re not done well, or old, they can be a real let down. A CHRISTMAS FEAST TO REMEMBER! Our day started well before dawn in North Wales, then we all scooted down to our wonderful venue Food Sorcery in Manchester and got the ovens fired up…. 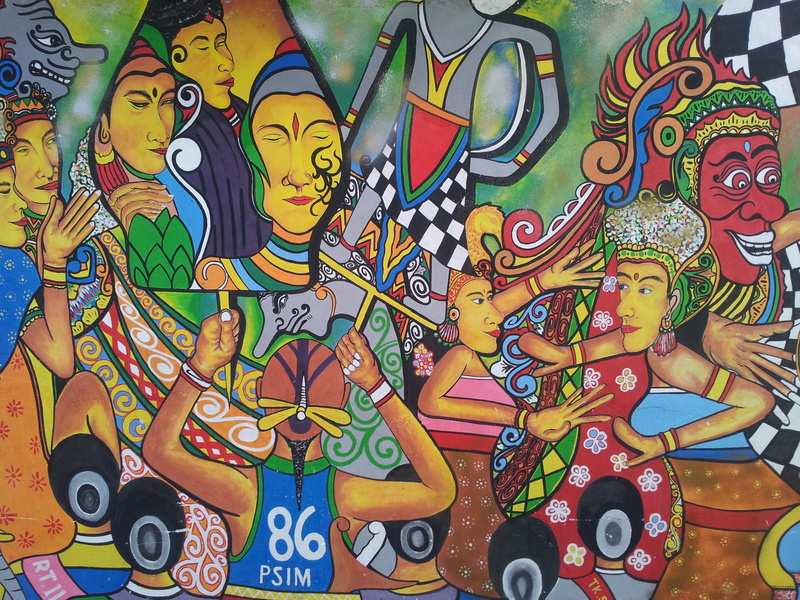 With a team of amazing people, we can do anything….. The day was a mixture of cooking demonstrations and hands on cooking, working from our specially designed recipe booklets and loads of support from the team. Still swinging! Groups worked in threes to cook a three course festive vegan menu, with all the trimmings. Menu below. 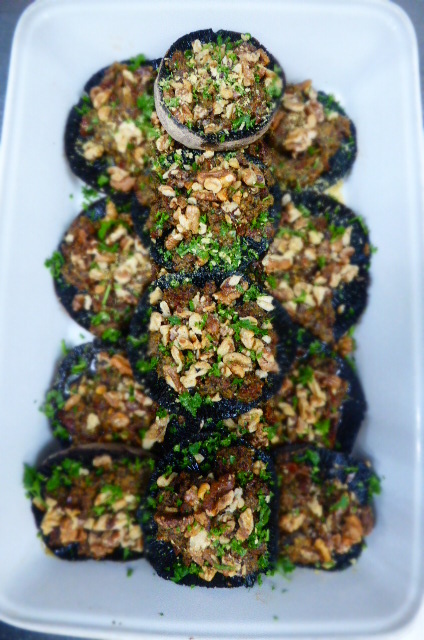 Some of the Portobello Mushroom Wellingtons made by the teams, recipe coming soon on the blog…. Is this the best time of the day? Lunch! An early Christmas gathering, a great rehearsal for the big day. Everyone left with a bespoke recipe booklet, a full planner for Christmas lunch and confidence that 2018 will be the best vegan Christmas ever!!! We hope to be doing more vegan cooking events in the new year, you’ll find all of our upcoming events right HERE. on Jeremy’s blog, right HERE. I’d just like to thank all who came to the workshop and contributed so positively, making it a special day. Hope to see you again soon in Manchester, Spain or somewhere else in the UK! DON’T MISS ANY BEACH HOUSE KITCHEN UPDATES AND EVENT ANNOUNCEMENTS. 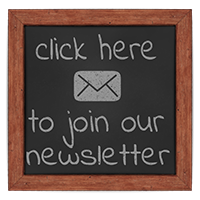 SIGN UP FOR OUR SEASONAL NEWSLETTER, CLICK HERE. This is one of my favourite all-time dishes. We eat this all the time! 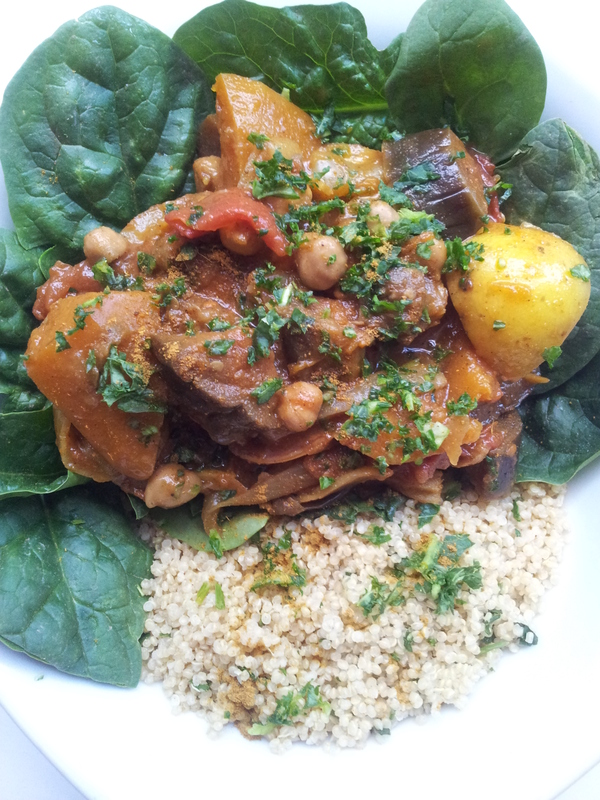 A warming, nourishing and revitalising bowl of perfect winter soul food. A ramen rainbow! Xmas is almost upon us, but this week I’m focusing on healthy, light and satisfying recipes to keep us full of energy for this busy time of year. This is a really quick meal and is a technique that once you’ve tried it out, can be very flexible. 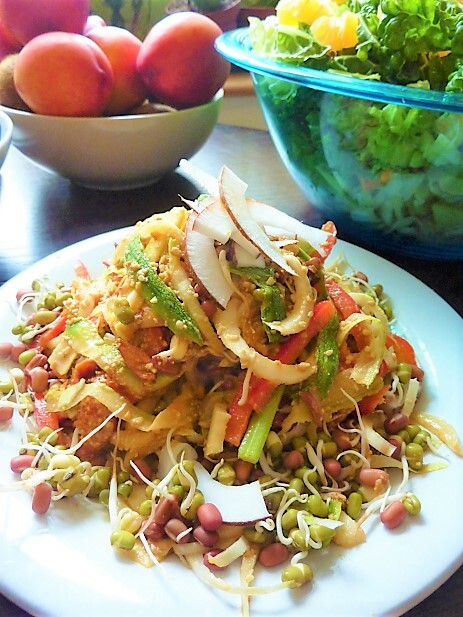 Swap veggies around and use tofu instead of tempeh, or some beans, for a protein pick me up. This soup is BIG on flavour, with the fermented goodness of miso and tempeh, it’s packed with all the nutrition we need to face up to and thrive in winter time. Adds a lovely, umami filled flavour. I use it in marinades, dressing, roasted vegetables and stews/ soups, it adds a totally new dimension and also has a load of health benefits, see the ‘Foodie Fact’ below. You can get miso in all kinds of colours; yellow, white, brown, red…..it’s normally made with soya beans but is also made using barley, seaweed, millet, hemp seeds and rice. There are hundreds of different types, many regional. It’s a fermented food, so filled with probiotic goodness, excellent for our digestive system or our ‘gut’ as many call it. A healthy gut has been linked with a sense of well-being, plus good mental and physical health. Miso’s flavour really depends on how it’s made, best unpasteurised, it can vary from sweet to salty, savoury to fruity and fermentation time can be anything from five days to several years. Miso is traditionally from China (named ‘Hishio’) and has been made since the Neolithic period! Miso soup is a staple in Japan, eaten most days and with white rice, makes for a tasty breakfast which energises and stimulates digestion. 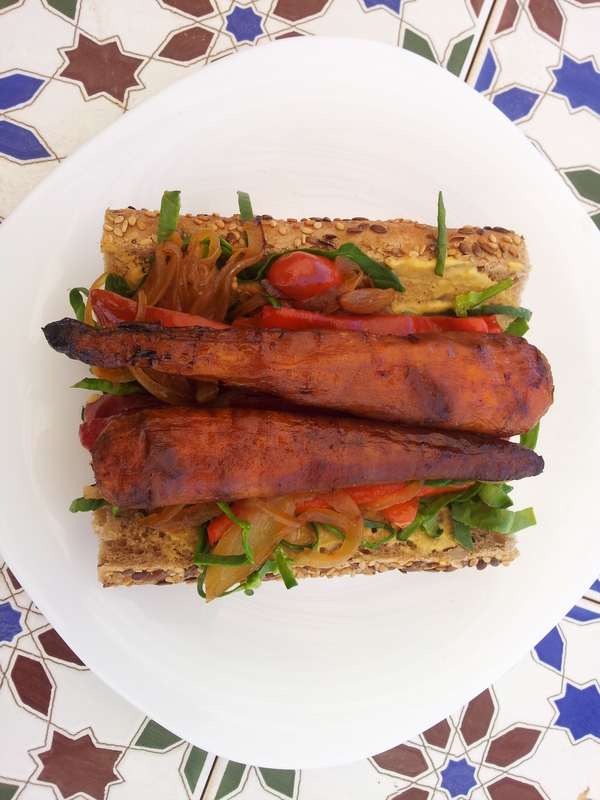 Tempeh may well be a new ingredient for you, it’s basically fermented soya beans, packed together. It is a very healthy and delicious food, even better for us than tofu. It traditionally comes from Indonesia and is packed with protein and adds a nice texture to a bowl of steaming noodles. Tempeh is becoming more popular and you’ll find it in your local, friendly health food shop for certain. Some supermarkets stock it too. We ate a lot of noodles on our recent China trip. Here’s a bowl topped with fermented bamboo shoots (very funky indeed) and a fermented bean paste broth, something like miso. I will post some more traditional vegan Christmas recipes soon, but we can’t live on Christmas pud and cream sherry alone, we need some quick and tasty food in winter. I hope you like this hearty, healthy noodle broth, I’ve been cooking versions of it at Trigonos for years and it’s always a hit at our cooking events. I think the most surprising thing is how easy and tasty it is. Steaming bowls, good for the soul! This is such a quick recipe to cook, make sure all your preparation and chopping is done before you get started. Don’t overcook the veg or noodles, we’d like a bit of crunch on the veggies here. This soup is best served straight away. Dried shiitakes can be found easily in Asian shops and Waitrose also do them. To add even more flavour, you may like to pan fry the tempeh with a little oil until golden and crisp. Then add to the noodles. The balance of flavour in the stock is important, it should be nicely sweet and sour, a harmony between vinegar, miso and tamari (soya sauce) that tickles your taste buds. We’re looking for big flavours here, so I’d recommend a darker brown miso, filled with umami. For gluten-free version, check that the miso is gluten-free, along with the noodles and tamari/ soya sauce. One of my favourite pictures of recent times. A great band jammin in the street. 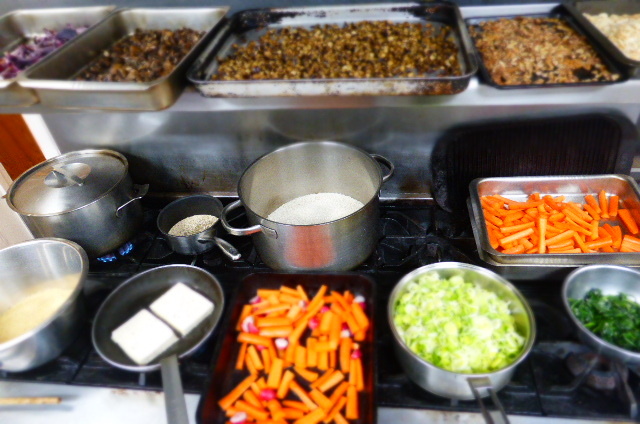 Get everything ready beforehand, this soup comes together pretty quickly! In a small bowl, mix together the tamari, miso and vinegar into a paste. In a large saucepan, bring your stock to a boil, add the dried shiitakes, boil for 2 minutes, then add the ginger, tempeh and vegetables (except the kale). Pop a lid on and simmer for four minutes, then add the noodles, cook for a 1-4 minutes (depends on the noodle type) until soft. Take off the heat and stir in miso mix and kale, add more miso if you like it stronger, add more tamari if you like it a bit saltier. Ladle into warm bowls and scatter with your favourite toppings. Miso is a good source of minerals like copper, manganese, iron and zinc plus vitamins like vitamin K also helps to keep our gut healthy. The probiotics present in fermented foods like miso help with the absorption of nutrients and support the immune system. Miso is high in salt, so enjoy in moderation! We always go for organic miso, it will say somewhere on the label. Keep your miso in the fridge, it keeps well and if it forms some light, white mould on top, this is natural. In Japan, they just scrape it off and get on with the broth. Here’s something quick and easy! Exactly what I’m looking for at this busy time of year. Light, delicious and nourishing. You’re probably getting ready for Christmas and maybe planning your Xmas menu, but I think we still need to eat well throughout wintertime. Home cooked happiness! Christmas is a great opportunity to cook something amazing, to challenge ourselves, try something new, but we also need some simple recipes. Quick and nourishing. Let’s eat well all the time!! Healthy home-cooked food is achievable, throughout the year. This dish uses the delicious spaghetti squash, hazelnuts and cavolo nero (black kale). These are some of my favourite wintertime ingredients. I wanted something warming and filling, full of delicious flavours, but not too rich. We need a little break from all the mince pies and puds! Is a large, thick skinned squash. They can be challenging to find in supermarkets, but I regularly see them in farm shops. 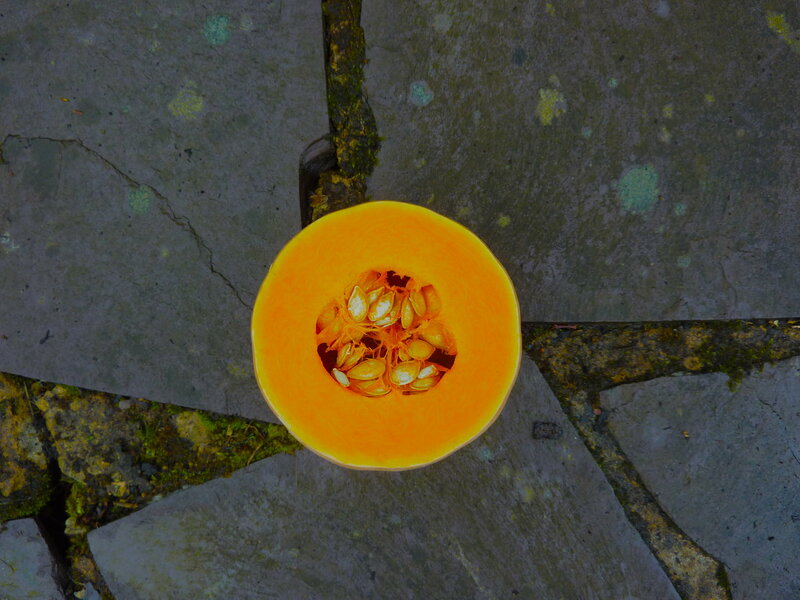 The squash can simply be chopped in half length ways, seeds scooped out, and then roasted until soft. Then scrape out the flesh with a fork and you’ll see what the ‘spaghetti’ is all about. It looks like spaghetti/ noodles and has a lovely light flavour and texture. You can use your favourite pasta/ noodles with this pesto, but I’d urge you to seek out a spaghetti squash, they’re just loads of fun! The festive season can be a full-on time, so eating healthy is important, in-between all the other indulgences! I will be posting more festive vegan recipes very soon, we all need a show stopping Xmas dish, I’ve got a Mushroom Wellington on the way and a decadent dessert. This dish would be lovely served with a few slices of our Moxarella – Vegan Mozzarella, recipe here. Also some pan fried greens would be nice, or steamed broccoli. Winter hasn’t really taken hold yet in the Beach House Kitchen, we haven’t been back that long from Spain! But it’s really mild and pleasant up in Snowdonia and we’ve been getting plenty of stunning sunsets. I’ve decided to embrace winter this year, I’m normally a creature of the sun, but I seeing all the good in drizzle and mist and chilly morning and a dusting of frost and snow on the hills. Winter is generally a dramatic time, fierce storms and giant waves, and at the minute, the stream in our back garden is almost bursting, but it’s cool. I’m going to take the time to sit by the fire, do lots of reading and playing guitar, and take some refreshing/ semi-frozen walks in the hills. Plus, I get to play around in the kitchen more, less distractions in the winter I find. Things naturally slow down. I love winter warmers like stews, soups and curries, lots of freshly baked things and soulful dishes. I’d mull anything! It’s a great time of year to be a cook and to create feasts for friends and loved ones. I’m not sure what it is, but I’m starting to like Xmas more and more as I get older. I’m even attracted to buying a festive shirt? This is a strange feeling that I can’t explain. I just want to say that Cliff Richard is a step too far for me. Sorry to Dad and other Cliff fans, but I just can’t get down with ‘Mistletoe and Wine’, but I do like that Chris de Burgh one. What do you plan on cooking this Festive Season? What are your favourite dishes/ songs? Have you got any new recipes you’d like to try? Are you trying out a Vegan Christmas for the first time? Let us know below in the comments and we’d be happy to answer any of you vegan Xmas questions. Sunset up in North Wales. Winter is a beautiful time of year here. Nooch (aka Nutritional Yeast Flakes) can be found in most health food shops. They bring the vegan cheesiness to the party. Preheat a fan oven to 190oC. Pull the root off your spaghetti squash and cut in half length ways. Scoop out the seeds. Rub with oil and season with salt and pepper. Place on a baking tray and cook for 35-45 minutes, until soft. Set aside to cool a little. While that’s going on, place all the pesto ingredients into a blender and blitz until a chunky pesto forms. We don’t necessarily want a smooth paste here. Scrape out the flesh of the squash, using a fork, and mix with the pesto until well combined. Serve straight away, some vegan parmesan would be nice. Nooch (aka Nutritional Yeast Flakes) are not only a way of adding a cheesy flavour to vegan dishes, they’re also packed with nutrients. Loaded with B12, essential for vegans and everyone actually, high in other vitamin B’s, zinc. They are well worth stocking and can be sprinkled on dishes, mixed into stews and soups for added savoury flavour. I know that vegan cheese have become more accessible and better quality, which is great news, but I will always use Nooch in dishes. Try frying or toasting it, it really intensifies the flavour., I now a guy in a Michelin star restaurant who uses it as a secret ingredient!! We’ve started a BHK youtube channel! Check out some videos of our latest vegan cooking workshops and demonstrations here. Creamy, spicy, fragrant, loads of colours and flavours, this is my kind of rainbow bowl. Laksa is a stunning combination of very tasty things, the perfect re-vitalising, comfort food we need in the winter time. We’ll cook with seasonal vegetables and giving them a exotic, Malaysian twist, this laksa bowl really lights up any table or meal time. We’ve enjoyed Laksa, in so many different ways, all across South East Asia; Indonesia, Malaysia, Singapore, but the very best (and we both agree on this) was in Southern Thailand. Which is strange, because I’ve called this a Malaysian Laksa, but it was just this one little place, on an island, beach side (in fact it was on the beach) restaurant. One of those special meals, where everything is right, sunset, waves, swaying palm trees, a friendly family running the place. The works! A recipe for a memorable meal. This Laksa, I think, resembles the one we had that night. Big and bold, with a generous amount of coconut. Truth is though, in South East Asia, you rarely get anything resembling a bad Laksa. Laksa is basically a noodle soup with a creamy and spicy coconut sauce. It normally has a sour element, known as ‘Asam’, here we add some fresh lime to give it that tickle and zing. Laksa is a fusion dish, with influences from China (noodle soup) and Malay (coconut cream and spices). Making Laksa vegan means no loss in flavour in the slightest, without the dominating meat or fish, the subtle and sensational flavours can work their magic much easier. I’ve gone the whole enchilada here, we make our own spice paste. This means lots of gorgeous ingredients, and a little time spent, but its SO worth it. You can also buy vegan yellow Thai curry paste quite easily, for a quicker laksa fix. I like a laksa with a chilli kick and lots of fragrant aromas, I use quite a bit of lemongrass, ginger, turmeric, fresh kaffir lime leaves (you can find them in the UK), all with the deeper background spices of cumin and coriander. It’s just awesome, you have to try it! Jane and I are in Spain at the minute soaking up the winter sun and the tasty tapas. Life is so peaceful here, we live close to the beach and can hear the waves at night. We’ve been doing some cooking out here and met some amazing new people, also spent some times re-energising and preparing for winter, lots of walks, swimming and enjoying the stunning scenery. We’ve got loads planned this winter and I’ve been focusing on creating lots of new recipes. We cooked this Laksa at our recent weekend of vegan cooking workshops in Hackney, see pictures here, and it was a big hit. I’ve never served this to anyone who didn’t think it was yum, it’s rainbow soul food. Could we ask for more?! Our upcoming Cook Vegan! event in Manchester is almost fully booked, we’re cooking a full festive vegan lunch and then of course we have our blissful Spanish cooking holiday next year. Come and join us on the beach! Maybe we’ll have Laksa in the sun? 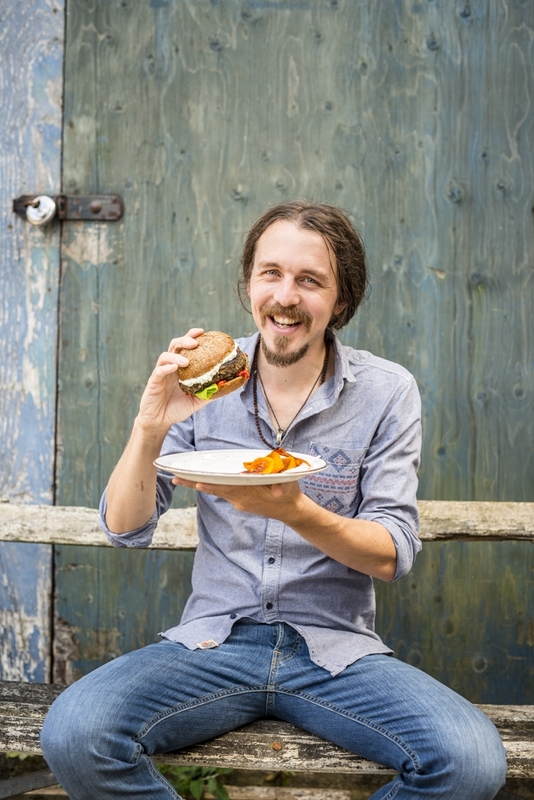 We hope you’re all enjoying cooking and feeling inspired to create and eat healthy, delicious and vibrant vegan food. Do let us know below in the comments if you like the look of this recipe, or have any questions, or just want to say ‘Howdy!’ It’s wonderful to hear from you. We love feedback, it helps us create and share the dishes YOU want to cook. Rice noodles will act as a thickener here for the soup. I love this, but if you’d prefer a thinner broth, blanch the noodles in boiling water and drain before adding to the soup. This will cook the noodles, so add them just before the end of cooking. This Laksa can be made a main course or starter, depending on the amount of noodles added. See below in the recipe. An alternative for this curry paste is to use a shop bought yellow thai curry paste, but homemade is soooo much better! Rainbow Vegan Laksa Bowl – Love it! For the paste – Toast the coriander and fennel seeds for 2 to 3 minutes or until fragrant. Add to a blender or spice grinder and grind to a coarse mixture. Add the rest of the ingredients to a blender or food processor and blend until a thick paste forms. Add a tbsp or so water if needed. The paste can be refrigerated for up to a week and frozen for longer. For the soup – Heat oil in a saucepan over medium heat. Add the spice paste and turmeric, cook for 8-10 minutes, stirring regularly. Check out those aromas!! Now add the squash and peppers, the vegetable stock, 1/2 teas sea salt and coconut milk, bring to simmer and cook the vegetables for 8-10 minutes until the veg is soft. Add in the rice noodles and green beans, let the mixture simmer for 3-5 minutes, stirring a little to make sure the noodles don’t stick together. Mix in the spinach/ kale. Taste and adjust salt, sugar and chilli, as you like it. I usually add a bit of salt or soy sauce, lime juice and some sugar at this point. 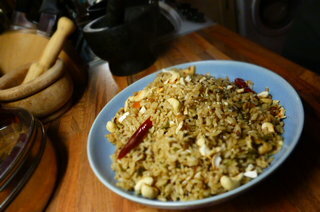 Serve straightaway, garnish with fresh coriander leaves, bean sprouts, chopped chillies, toasted peanuts. Finally, squeeze over you lime wedge and then throw it into the soup. Adds to the flavour! Lemongrass not only adds wonderful fragrance to this Laksa, it is also high in iron, potassium and magnesium. Just what we need in late Autumn! Soups with lots of colours and big flavours. Get a little spicy, plus a little smoky this autumn! This is a radiant soup filled with delicious flavours and fresh, seasonal produce. 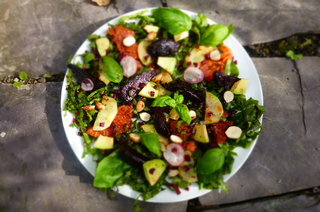 Lots of beetroot and red peppers, this is exactly what I want to be eating right now. It’s adding a vibrant slice of Mexico to your autumn and all you’ll need are staples most of us have in our cupboards and some chioptle chillies/ chilli paste. More of that a little later….. I wanted a soup that was hearty and sustaining, so we have lentils, colourful and healthy, so we have red peppers and beetroots, a little creamy, creme fraiche, a little crunchy, pepitas (or pumpkin seeds as we call them), finished with a sprinkle of fresh coriander and you’ve got a very tasty bowl indeed. I’d happily eat soups like this all day, every day, until next May, when things thaw out. We’ve been getting frosty over here in Snowdonia, the first glimpse of snow and ice on the mountain tops, washing freezing on the line, that beautiful early morning frost that makes all the plants look like their draped in jewels. I love this time of year. 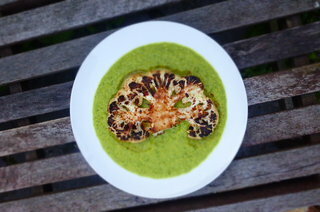 Lots of sunshine still, so soup in the garden is also doable. I’m thinking winter BBQ’s are on this year! Why not? The first frosts always says to me, “Parsnips!” They’re always bettter after the first frost, as well as sloes. I’m lucky to have travelled Mexico extensively, I drove around it for a while with some friends, from the border with Texas right down to Guatemala. It took about 6 months. I was in my 20’s and, as you can probably imagine, I had a good time! There is so much joy for living and eating in Mexico!! I had no idea how good Mexican food was until my first few days wandering around Mexico City. I’d been working in fine dining style restaurants and was really into that way of doing things, but my first few tacos in Mexico blew my mind. 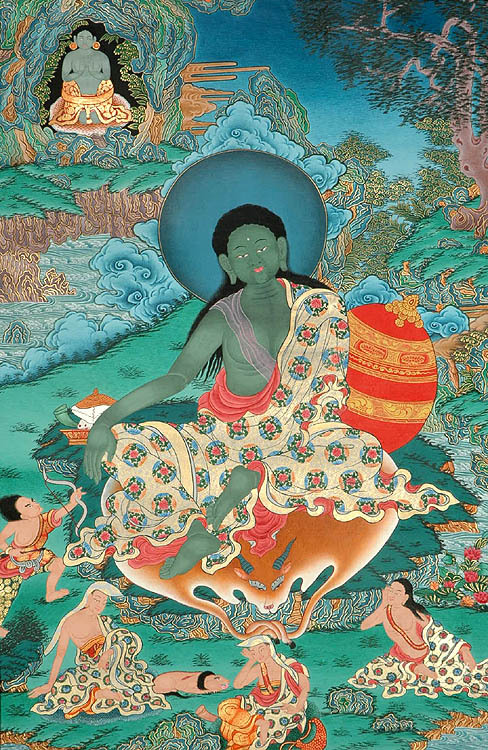 I was hooked and a new way of approaching food dropped into my world. Sensational food didn’t need white table clothes and weighty price tags, it could be fast and furious on a street corner, or served in the back of taxi mid-traffic jam. Good food is everywhere in Mexico, it is hard to escape, and let’s face it, why would you want to escape it anyway! I ate some INCREDIBLE soups in Mexico. If a soup can be life changing (if your soup was changed by your life, or vica versa, please let us know, we’d like to hear that story!) I had many in Mexcio. Things I’d never imangine, avocado is soups, soft cheeses in soups, garlic, nachos, smokiness, it really blew me away. Mexcian food is so rich and diverse, lots and lots of new dishes to explore. Having said all of that, this soup is not a traditional Mexican recipe at all, but Chipotle chillies make anything taste Mexican to me. They were one of the many new flavours I discovered on my trip. The cumin in many Mexican dishes originally came from Spanish immigrants, who picked it up from North Africa via the Moors. I’m fascinated by the way that our food tells us a lot about our history, how our cultures developed over time. 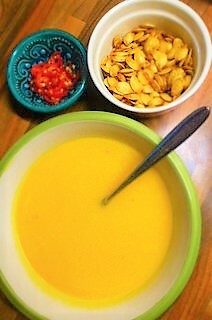 It is Day of the Dead tomorrow, this soup would be a perfect addition to the feast! Chipotles are dried and smoked chillies, one of many varieities. I remember buying smoked chillies in markets, so many types, big and small, different colours and shades, all with distinct flavours. It was steep learning curve. Chipotles start off as red jalapenos and are smoked and dried for days, coming out looking a little like the chilli version of a raisin. You can buy them in many ways, powder, flakes, dried whole, in cans or in a potent paste, as we use here. Chipotle’s are used in all kinds of marinades and stews, they give a subtle earthy, smokiness to dishes with a little kick of chilli. Adding one chipotle to a stew or soup can really mix things up. In the UK, they are normally found in paste-form, in little jars, that keep well in the fridge. I like to mix it into mayonnaise, dressings and generally use it as often as possible. I love the flavour. It’s very unique. I am off to Spain soon, where they do some nice things with smoked chillies, but honestly, no one smokes chillies like Mexicans. Spanish chillies are very mild, they hardly tickle, Mexican chillies however, they can melt things, or just add a lovely spiciness to dishes. So get your beet on, gather some lovely veggies and have fun with this soup. Beetroots are the most outrageous roots and I think we underuse them in the UK. The colours, flavours and awesome nutrition (see below) they bring to our table are always very welcome. Please let us know if you like the recipe, enjoy Mexican food, or anything else really in the comments below. If you try out the soup, why not share your kitchen creation with us all over on Facebook, our cooking group is here. More soups and hearty, healthy, delicious vegan recipes for everyone coming soon…..
Here’s some Mexican inspired dishes we’ve cooked in the paste, from Loaded Nachos to a Cashew and Kale Mole, Pickle your own Jalapenos and Dark Chocolate and Chilli Bronwies. If you love your smokiness, add a little more chipotle, or add smoked paprika (same time as the cinnamon) for a smoky, but less spicy soup. No red peppers, any pepper will work fine. Same goes for the pumpkin seeds, any toasted seed or nut would be nice here, but pumpkin seeds (pepitas) are used quite a lot in Mexican cooking. In you’re getting beetroots with their leaves on (congratulations! 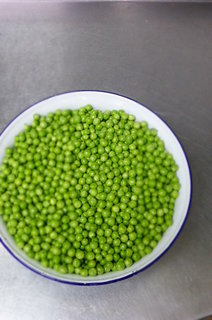 ), you can cut them off, wash them and stir them in at the end of cooking, just before serving. You may also like to do this with spinach, kale or any other greens. Adding greens to dishes can never be a bad thing. In a large saucepan, add 1/2 tbs cooking oil and warm on medium high heat. Add the cumin seeds, stir and fry for a minute, then all the onions, peppers and 1 teas sea salt. Fry until soft and slightly caramelised, 5 minutes will do. Add the lentils, beetroots, oregano, ground cinnamon and tomato puree. Then pour over the vegetable stock and bring to a boil, lower to a simmer and leave to cook for 35 minutes, stirring occasionally. 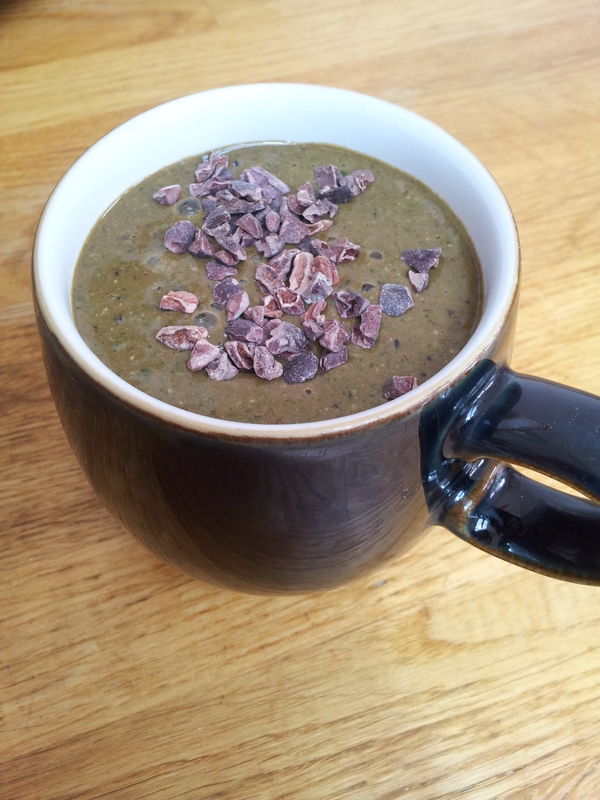 Allow to cool slightly and blend using a stick blender or pour into a blender and blitz until smooth. Taste and season with salt and pepper, adding more chipotle if you like. 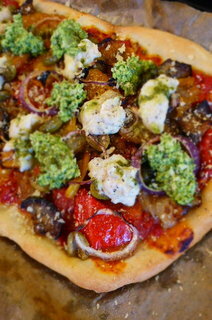 Top with toasted pumpkin seeds, creme fraiche/ single vegan cream, chillies and coriander. Beetroot is a stunning root in more ways than one. Besides the amazing flavours and colours, we’re talking about a contender for the healthiest veg ever! It’s well up there. 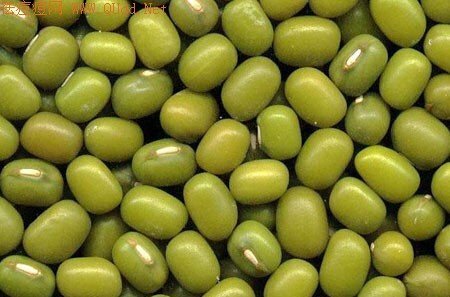 Packed with anti-oxidants, plenty of fibre, it is very good for our digestion, and also contains plenty of minerals. Beetroot juice is now drank by many atheletes to improve performance. 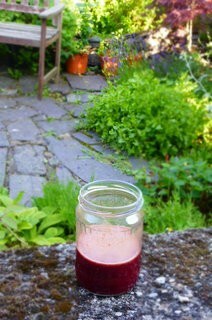 We love beetroots mixed into juices or smooties with things like apples and carrots. What an amazing way to start the day! Would you like to come and cook with us? 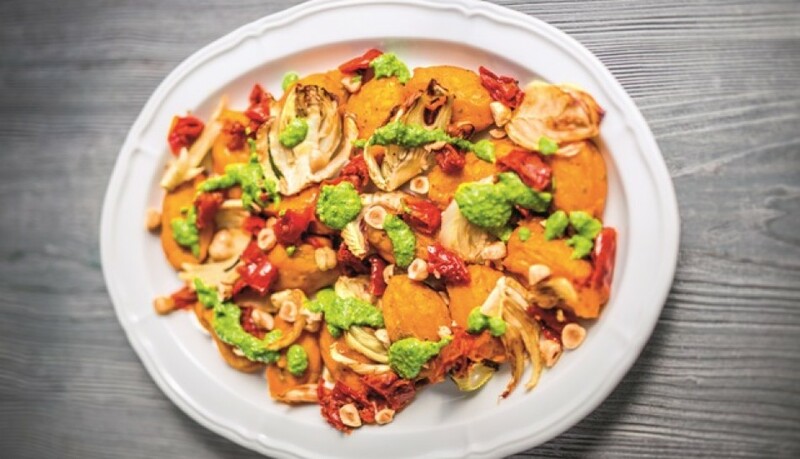 Learn how to prepare a delicious three course vegan Christmas Lunch? Our next cooking workshop is in Manchester soon, more details here. Thanks for your patience everyone, I’ve finally got around to posting this recipe. It’s been a long time coming, but I’ve had a few things on my plate (see below;). These dumplings are perfect with pasta and a rich tomato sauce, but also ideal served in a wrap, as a canape/ starter. This is a simple and versatile recipe that has recently become a staple in the BHK. I have noticed that non-vegan really dig these, they taste like dumplings but are made with chickpeas and oats. Easily made gluten-free and can be pan fried or baked. That to me is the hallmark of a staple recipe, something that is not too fussy, that can be whipped up in a short window of time and most importantly, are very delicious. The base of chickpeas and oats can be played around with, you can take the flavours wherever you’d like to lead them; add spices for Indian dumplings, served with a spicy curry sauce; add za’atar and make things more Lebanese, serve in a wrap with tahini; add some chilli, ginger and coriander, serve with noodles and Chinese sauce (sweet and sour, black bean, hoisin…..) So, so many ways to make your dumplings shine!! The autumnal beach – spectacular Snowdonia! Jane and I are heading over to Spain very soon, can’t wait! In one way, it’s a shame to leave Snowdonia right now, so much sunshine and last night the mountains got their first little cap of snow and frost. Icy winds, sunny days, I love that about these wintery times. In this climate, I flip into soup mode. Just made a huge pan of veggie broth, old school, like my Nana’s did it. 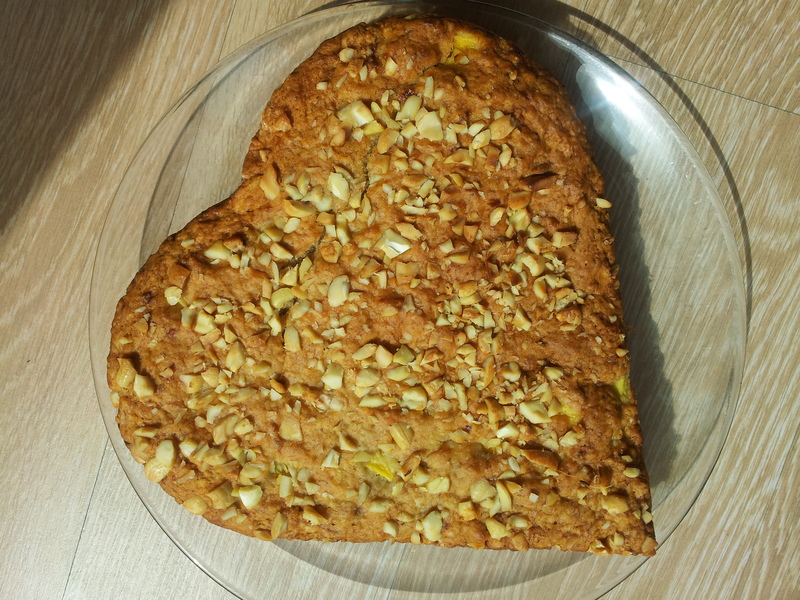 Plus some quinoa bread, not quite the same as Nana-made bread, but I reckon they would have liked it. Plenty of strawberry jam. These dumplings have been discussed quite a bit over on our vegan cooking group on Facebook. I’ve been meaning to post this and a huge stack of recent recipes, but life has been nice and full recently. Lots of cooking, lots of cool new projects, lots of time hanging out in the mountains. It’s been a stunning autumn. I’m posting much less at the minute because I’m cooking much more. I’m very cool with this balance. I love the blog and facebook and all, so many awesome people and connections made, an online community of plant-lovin’ foodies, but being in the kitchen is where I’m best suited. If you’d seen me type, you’d know what I mean!! I’m better with a pan than a kepboard. I’ve been developing recipes, cooking at the beautiful Trigonos in North Wales, running cooking events and yes, working on a new cookbook. It’s in the pipeline. Thanks to all who have sent messages of support, many which say things like “Where’s your new book dude?” It’s coming and the time is now right, I wanted to wait until I had and idea and a group of recipes that really rocked!! These bookie type things can take a while, but fingers crossed, I’ll have some more news soon. If you haven’t heard, here’s my last cookbook, Peace & Parsnips. Any ideas about what you like in a cookbook? Do let me know in the comments below. I love to hear your feedback. Really, I write recipes partly for me, but another big part is for you. The readers of the BHK, I wonder a lot about what you’ll like and always listen to your comments. Other news. We sent out our autumn newsletter recently, if you missed it, just sign up here, it takes a few minutes. 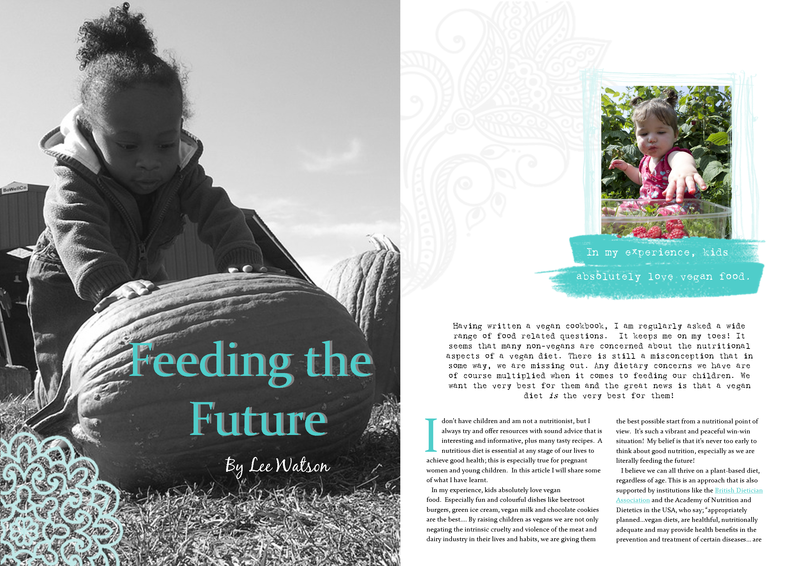 We’ve got some cool interviews (are you interested in fermentation, we interview the Queen of Fermentation! Janice Clyne), plus recipes, pictures, news, events, loads of nice things. Sign up, we’ll send it across. You can see that I like these dumplings with a little colour, from a hot pan. You can cook them on a lower heat if you like, we’re just really warming them through. You can make the dumpling mix well in advance, keep in the fridge and just roll up the dumplings when you need them. They freeze well. Another nice idea is to make a plain version of the mix, without the tomatoes and herbs, then flavour the dumplings as you like with different dishes. This makes them super versatile. 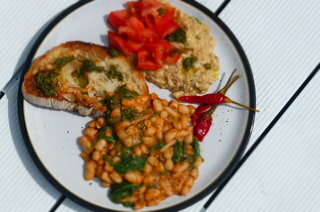 If you are cooking your own chickpeas, not using tinned, make sure they’re not overcooked or mushy. This will lead to a wet mix, which is not what we want. If this happens, I’d recommend adding gram/ chickpea flour until the mix firms up a little. Remember that once the mix cools, it will get thicker. In a large frying pan, add 1 tbs cooking oil, warm on medium high heat, add the onions and garlic. Saute for 5 minutes, until soft and golden. Add the cooked onions and the rest of the ingredients to a blender, with any oil left on the board from chopping the sun dried tomatoes. Blend until smooth-ish. Some chunks are fine. Taste and season if you like. With slightly wet hands, roll around 2 heaped tablespoons of mix into balls. Place on a plate. Warm the frying pan again, add 2 tbs oil and warm on medium high heat, add some of your dumplings to the pan, don’t overcrowd. Roll them in the oil and get them well covered, fry them for 6-8, minutes, until golden all over and warmed through. Set aside. Fry in batches if needed. Alternatively, preheat a fan oven to 180oC, lightly oil the dumplings and place onto a baking tray, then into the oven. Cook for around 15-20 minutes, until they are warmed through. Serve with a rich tomato sauce, freshly torn basil leaves and pasta of your choice. Chickpeas are a real nutritional powerhouse. They are filled with protein and fibre, also lots of minerals like iron, magnesium and potassium and vitamins like Vitamin C. Chickpeas are also a good source of calcium. Overall, the more chickpeas we can get onto our plates and forks, the better! Apple Crumble Cookies – Gluten-free, Vegan. Yes please! If you’re a fan of apple crumble, you’ll love these! The cookie version. I wanted to combine the best things about an apple crumble into a cookie, just to change things up a bit. That lovely crunchy crumble and the sweet tartness of the apple sauce. 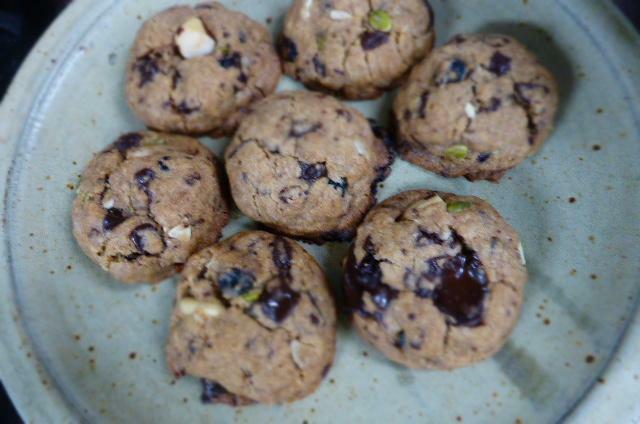 These cookies are crisp on the outside and very apple-y inside, with that lovely warming cinnamon and plenty of oats. 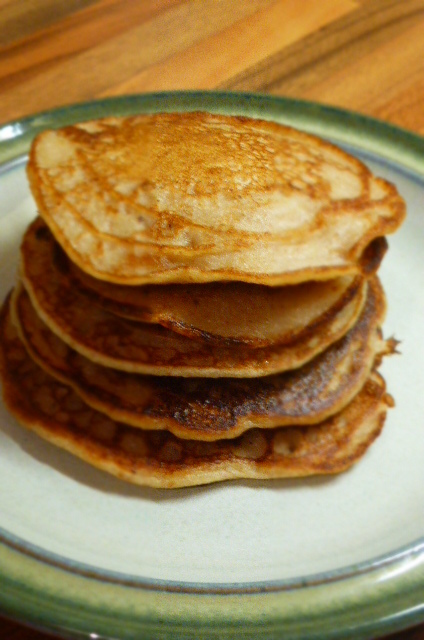 They’re even gluten-free, but you can make them with wholemeal flour and normal oats. I’d just like to invite as many people as possible to the good food party! These cookies are sweet! But balanced with the tartness of a green apple, I’ve used russet style apples from our neighbours garden, donated, not scrumped (see all our scrumping talk on our last post). I think an apple with good acidity and a bit of bite is what we’re looking for here. The best things about a crumble, wrapped up in a cookie! Please don’t worry about us, we’re still eating plenty of Apple Crumbles this autumn. Jane loves ’em too much! But these cookies were a big hit with everyone who’s tried one, even our neighbour Meirion, a man who dearly loves a good crumble, is a fan of the cookie variety. That’s when I knew this was a winner, they got the nod from our Meirion. We’re just fixing our fire at the minute, autumn is giving us those signals, nice and crisp at mornings and at night. The occasional dramatic storm. I do love sunshine, but I admit that a roaring fire on a cold night is very tempting. Just need to get a big pipe and stick it onto the back of the fire. Some of you know all about my DIY skills, so I’ll probably get the fire man in. I’m better off with the pots and pans! Another bonus of autumn is all the produce, I’m just blown away at the minute. I just got the list through from our local organic farm and it knocked my socks off. As a cook, I almost don’t know where to begin with it all. I feel very lucky to have such problems!! We’ve got a couple of events coming up this month, check them out here, so we’ll be taking our amazing Snowdonia produce for a ride down to London and over to Anglesey. 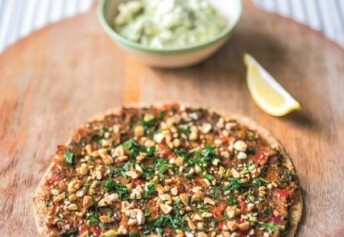 I’m back cooking at Trigonos this week and I love to create new recipes like this. There are many gluten-free visitors who need catering for, the Trigonos cooks come up with all kinds of gluten, sugar, oil, nightshade, salt etcetc free dishes. I’ve always found it a great challenge, but having dishes which are gluten-free and vegan is a sound start to planning a menu. These cookies can be enjoyed by loads of people! Maybe you’re gluten-free, but I bet you know someone who is. The mystery of gluten-free baking is disappearing as more and more people experiment with new ways of making cookies, cakes, scones and tray bakes. Chopping your apples up nice and small is one of the keys to success with these cookies. Of course, take all the pips and core out, but I leave the skin on. These apples had nice, thin skins and I reckon there’s some nice flavour there when baked. You can see the apples turn a lovely golden brown in the oven, something like apple crisps. They’re good these cookies! These kind of cookies are going to make this autumn very sweet! Hope you get to try one soon. You can use flax seeds instead of chia seeds. Pop the seeds into a blender and blitz until a fine powder is formed. Then mix that with water until a gelatinous mix forms. It only takes 5 minutes or so to get nice and thick, ready to bind our cookies together. 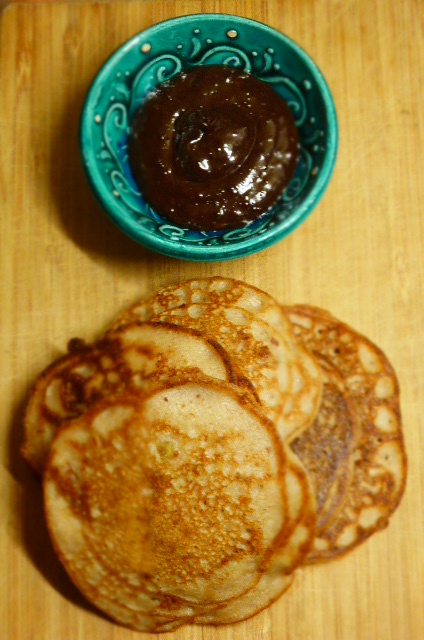 Ground flax and chia are ideal egg replacers in vegan baking. You can also use light brown sugar in these cookies, although I prefer the texture using the golden caster sugar. I used a Dove Farm white gluten-free flour mix here. It works really nicely. Gluten-free oats are available in most supermarkets. I use cold pressed rapeseed oil here, but you can use most, neutral flavoured oils. I prefer cold pressed oils. In a large mixing bowl, mix together the dry ingredients. In another mixing bowl, mix together the sugar and the wet ingredients. Pour the wet ingredients into the dry ingredients and stir until just combined. Don’t over do the stirring. Fold in the apples. Line a baking tray with baking parchment, form roughly two heaped tablespoons worth of cookie dough and apple in your hands, roll into balls. Press the pieces of apple into the cookie ball as you go. The apple keeps the cookies nice and moist. Press this ball down gently onto the baking tray, forming a rotund disc shape. Continue until the mix is used up. Bake for 17 – 20 mins on a middle shelf, until the apples are golden brown and the cookies form a nice crust. Leave to cool for 20 minutes on the tray before enjoying. Remember that the cookies will firm up as they cool, don’t worry if they are a little soft to the touch. 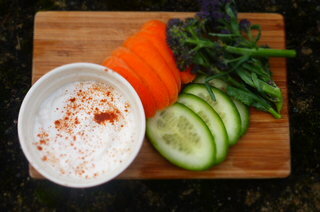 We had ours warm, dipped into vegan creme fraiche. Yes! It was very good. These cookies will keep nicely in sealed container for a few days, they do get slightly softer. Just before they hit the oven – Apple Crumble Cookies This was an early attempt, these apple chunks are a wee bit too big. Go for very small pieces. An apple a day keeps the doctor away. Why? Because my Nana told me that, what more proof do we need?! Apples are a good source of fibre and vitamin C, plus potassium, which is good for the heart. This recipe was voted for over on our Vegan Cooking Facebook group, you can join here. I like to see what you think about recipes before I post them. Plus there’s loads of vegan cooking chat and pictures over there. Pop over, sign up and show us what you’re cooking? Yes! It’s that time of year. Apples are falling from trees and we’re loving them. But I find something very sad about piles of crushed and fermenting apples scattered around pavements and fields, left in piles to rot around trees. What a waste. I’ve been travelling quite a bit around the UK recently and seen many great apple trees, laden with fruits, fit and ready for a good scrumping! There are over 2500 varities of apples growing in the UK, so I’m not talking about the handful of varieties we can pick up in the supermarkets, I’m talking about the real deal, heritage, local apples. The ones which flourish in certain areas because of the specific climate, regional apples, that’s what gets me excited. Most of these are growing wild and many may be falling right now, grab a bucket and get out there! Maybe you have some of these growing in your garden? Or a local park? I love these names, many are poetic, rustic, some amusing, but they all speak to me of a different time of food production. When it wasn’t just about business and high yields. I think it’s paramount to protect the heritage and diversity of locally grown food, in the UK and around the world. Most of the varities are just about hanging in there (no pun intended), mainly growing wild or in gardens, but we can always ask for them in our local shops and supermarkets. If we can get together, in enough numbers, and demand real, local, British apples, maybe we can see apples like the ‘Dog’s Snout’ back on the shop shelves where they belong. These names really brighten up my day. There is a great story here in North Wales about a local fellow, Ian Sturrock, who discovered a single apple tree on a remote island off the Llyn Peninsula. Bardsey Island. When it was tested, it was the last of it’s kind in the world. This variety has now been saved and it’s grown around the world, from Japan to the USA. We have one in our garden. Lovely golden, sweet apples. There is also a variety of Snowdon Pear which is very rare, tastes like sweet fennel and has a light pink colour inside. You just don’t get such variety and range of flavours in the most shops. We are missing out big time! This is one of our greatest British foodies assets. Our amazing fruits. 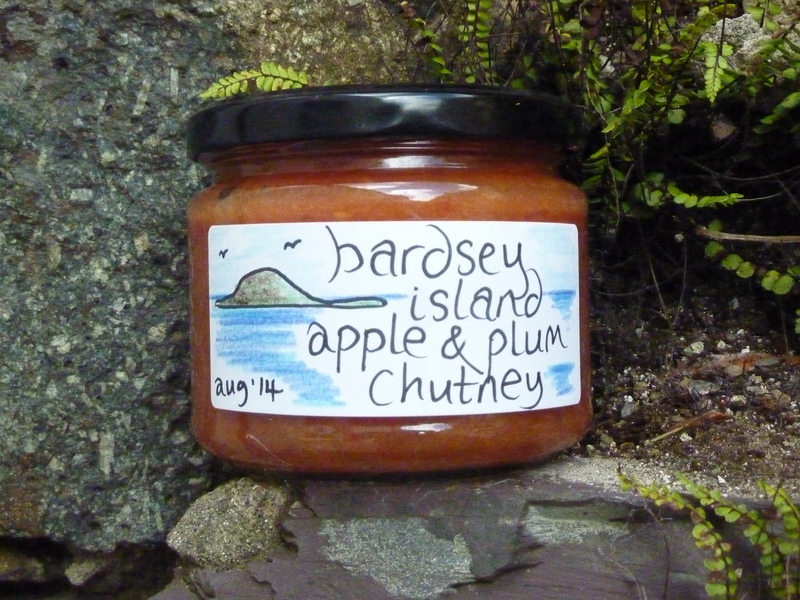 Here’s our article from a few years ago all about our love for the Bardsey Apple. Just make sure that you’re picking edible apples. Don’t climb and fall out of trees. Don’t blatantly nick your neighbours apples, this can lead to bad vibes and unneighbourly jams. 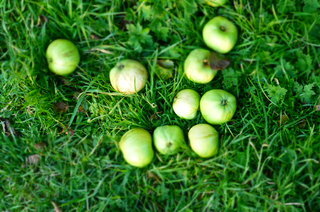 If councils or land owners have put up signs saying ‘DO NOT PICK THESE APPLES’, best to leave them dangling. Picking fruit gets me in touch with nature again, you plug straight back into the natural world, it’s relaxing and a great excuse to get out in the fresh air. One friend told me that the art of scrumping is to not get caught. I think there has to be a slightly more moral approach than that. Plus, scrumping is not illegal anyway, there’s nothing to feel guilty about if we’re following a few, common sense guide lines. You don’t need to live halfway up a mountain like us to scrump well, urban scrumping is on the rise. Inner city fruit foraging. It may take a little research at first, trying to understand what apples are best for eating, which are best for cooking etc. But once you’ve identified a local tree, that’s it. Every year you can pick a crop of delicious local apples. The benefits of scrumping are free food! Plus, no packaging or plastic and the only food miles are the steps you take. I just don’t understand why we don’t plant more fruit trees. Local councils, lets get more orchards going, even if they’re beside motorways or near pavements etc. 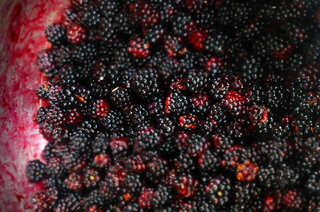 We can organise groups of fruit pickers and jam makers, free neighborhood jams and chutneys all year! Some local councils have done this in the past, after complaints from residents about being hit by falling fruit and apples impeding their driving. They provided fruit pickers and yes, gave the chutney away for free! This seems like a wonderful idea. We know people who pick your apples for you if you’re too busy/ can’t be bothered and make them into a cider and sell it. Their business is based on free or donated apples. We’ve even written a step by step post about How to plant your perfect apple tree. We’ve got all the apple bases covered. One of the best ways of using up LOTS of apples is to make your own cider. You do need loads. You will also need a cider press for this, but again, there will no doubt be someone in your local community who has one you can borrow or use. Especially if you offer them a small cut of your cider. Of course, we’re not just looking for apples when we’re in scrumping mode; sloe berries, rosehips, blackberries, damsons, mushrooms, bilberries (see our Bilberry and Spelt Scone recipe), pears, there is a bounty of fresh fruit growing on trees and bushes all around the UK. We just need to get out there and have a look. If you are really not fancying scrumping, you can still access local fruits. Check out freecycle, there may well be someone in your area looking to offload some apples or other fruits. If you do scrump, remember that it is illegal to profit from the fruit you harvest from common or council land. On private land, you’ll need a ‘scrump pass’. If you are not a comfortable single scrumper, it can make for a great family activity or form a small local group. Scrumpers unite! Some people feel scrumping is a bit cheeky, but that’s the fun bit! If you’re a serial scrumper of have some scrumping tales or advice, please let us know in the comments below. National apple day in the UK is 21st October ’18. Let’s celebrate local apples, fruits and produce! Autumn is the perfect time of year to cook and shop local. Look out from my next post if you’re an apple lover, we’ve got an Apple Crumble Cookies (Gluten-free) recipe coming your way very soon. 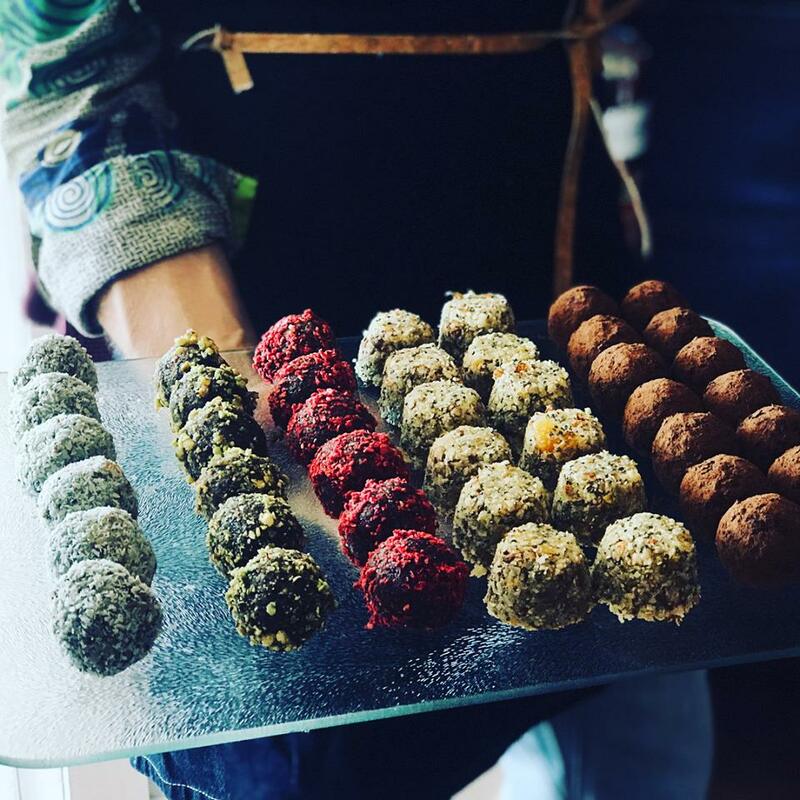 We’re teaming up with the wonderful Claire Mace from Inspiratrix Yoga for a relaxing and rejuventing day of yoga, a cooking workshop, nourishing smoothies, cakes, plus I’ll be preparing a plant-based Autumn feast using local organic ingredients. You can book now right HERE. We have a few places still available.